and are inching closer to the Ocean. We're taking full advantage of Wâtte and his car. The tent, sleeping bags and sleeping mats go in his trunk. All else we bring with us. We hook the tracking device up for a first full day of tracking ability. You can click on the link on the home page and find out where we are. Ready to ride through Arizona. We find our way to the north end of town with ease. Most roads have bicycle lanes on the side. This helps navigating even more. 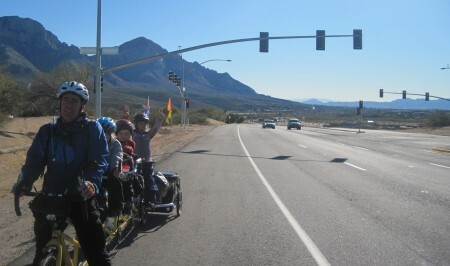 We're slowly climbing towards the Catalina mountains. It is a good feeling to be back on the road again. All of us together. In warmer weather. We've struggled with the cold weather for over a month. The choice we made this week was the right one. It's time to move on. 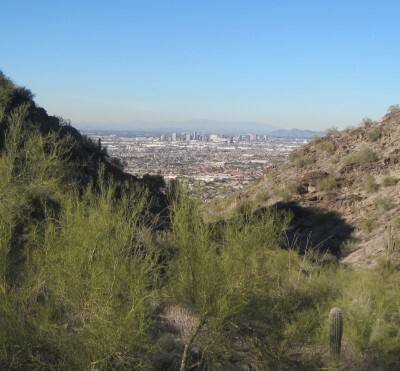 Now we are on the south side of Phoenix, we are looking for a road to get to the west side of Phoenix without having to go through town. 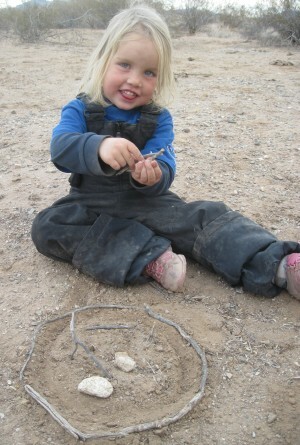 Our map gives the option Komatke, Avondale, Tonopah. Looks like a plan. There is nothing better then the open spaces to ride through. 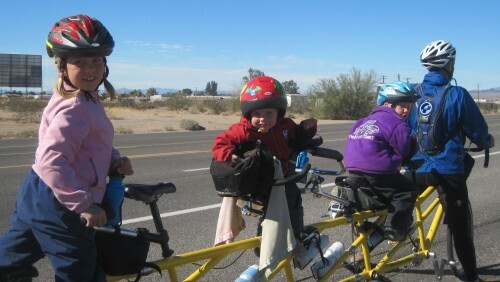 Today we are mostly in Tucson and its outskirts which keep on stretching and stretching. We can't tell where one town ends and the other begins. The road keeps on climbing and so are we. We didn't realize Tucson was in a valley, or so it seems. Climbing out of the Tucson valley. We have a special new years eve lunch at the Olive Garden. It's sometimes hard to remember the special days of the year. Even on our journey the days sometimes roll into one and other. We certainly can't say that of these last couple of weeks. Dealing with the winter weather. Christmas in Santa Fe. Now Wâtte being here with us. It keeps us in the moment. 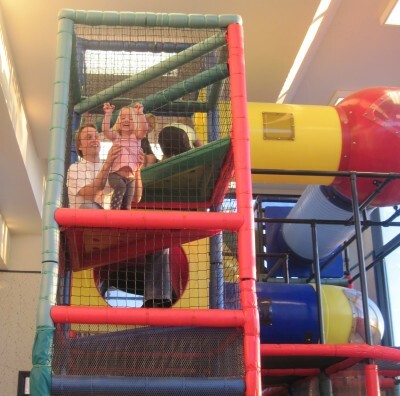 As new years eve celebration we head for the playground at the Burger King. To the girls delight omke Wâtte is climbing into the playground with them. What's even better is that he beats Amarins in a game of cards later on. Happy New Year everyone. Be the miracle you want to see. It was quite a cold night. Not so cold that there was frost on the ground, but enough to stay as deep in our sleeping bags as possible. Wâtte's bag was not warm enough. Tonight he'll dress warmer for sure. For us it's good to be in the tent again. The last time was in Texas. Over a month ago. With the luxury of having a car we head a mile down the road for breakfast. No luck at Burger King; they don't open till nine. So it's McDonalds. When the chill has worn off we start packing up. Wâtte will scout the road once more. Our aim for today is Florence. He'll check on places to rest and mileage to go. Riding through the saguaro desert. The first ten miles we climb slowly. From there it slowly rolls down ward through a saguaro desert. The saguaro's are incredible. We thought we'd seen it all in the Saguaro National Park. But this beats it all. 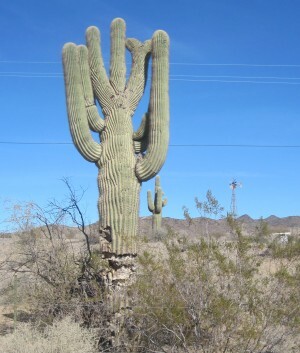 The saguaro's are huge and are growing in abundance. It's a truly beautiful drive on Arizona road 79. A flat tire on our trailer. After the break it's Wâtte's turn to be on the bicycle; much to the delight of the girls. They hoot and holler, they sing and whistle. Amarins follows by car. Sometimes ahead, trying to find good spots to take pictures. The men are riding so fast that they sometimes are past the spot before Amarins is properly set up. Again Wâtte has found us a place to camp. This time at the fancy Rancho Sonora. 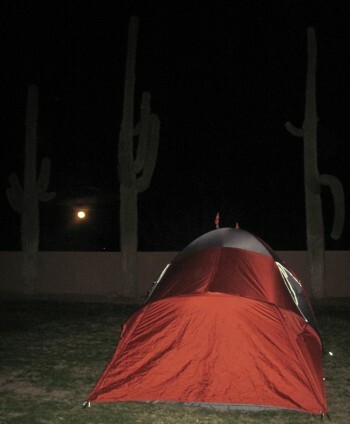 An established rv park with mature saguaro's near Cactus Forest. It's a couple of miles shy of Florence, but that works out just fine. Tomorrow we can take Cactus Forest road to Coolidge and by doing so cut off a couple of miles. Amarins waits at the entrance to the campground. Just as Bill, the girls and Wâtte pull up, so does a police officer. With his lights on. Very friendly officer. He's just following up on a call. Part duty and part curiosity. 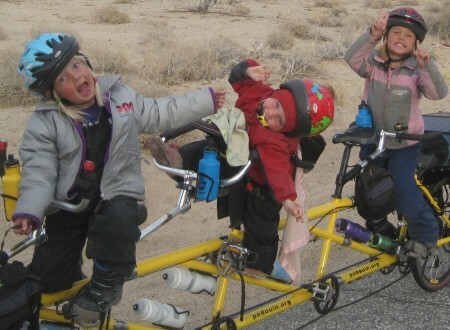 Someone had called into the police station to report 'two grown-ups on a bicycle with three girls in a trailer'. He certainly didn't expect our kind of bicycle. We have a great spot to put our tent. In the grass next to a row of saguaro's. A fence to put our bicycle against and a horse shoe game just a couple of yards away. Just perfect. Since it's still early we all have a time to clean up before we head to town for supper. We're certainly being spoiled having the car available. A full moon over your campsite is such a special thing. It wasn't too cold last night. It makes for a good night of sleep. It feels good to have the flexibility of sleeping in the tent again. As long as we can find a place to pitch it, we'll have a place to sleep. We take the road to Coolidge. Wâtte goes a little further and heads for Sunlakes. He's again on a mission; to find a place to camp or somplace to stay. 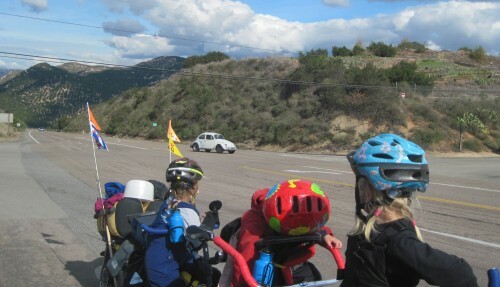 After a playground stop in Coolidge we head west on state road 87. The terrain is totally different from yesterdays. There are no saguaro's. The land is used for agriculture. We see cottonfields, no longer with crops on them, but the bales of cotton are proof enough. Alongside are irrigation canals. Water can certainly make a difference in the desert. The joys of a follow car become more and more obvious! Thanks Wâtte for the milkshakes and the refreshments! Wâtte has checked out Sunlakes and it doesn't look good. It is a town of gated communities. Everywhere he asked he received a no as answer. There are no motels or hotels either. A couple of miles further out of town the desert opens up. There is space to camp on the other side of the interstate. It's five miles further though, but doable. We follow Wâtte through Sunlakes and grab a bite to eat on our way through. The town is like an oasis in the desert. Green everywhere. Palms and grass, flowery bushes. Amazing what water can do to a desert. Fountains and little ponds spruce it up even more. But when the water stops, the desert takes over. Just across the interstate we find a wide spot in the road. Just right for a night under the stars. Wâtte did it again! 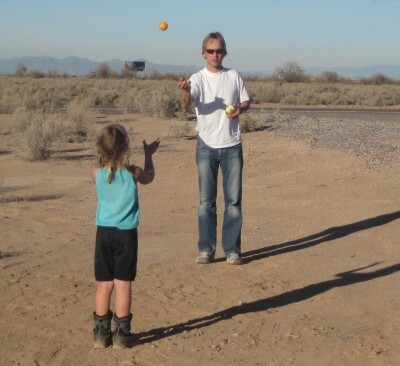 Playing catch with an orange while we set up camp. For supper we have a rotissery chicken, freshly from Walmart. Yes, it is undoubtedly true, having a car around is very convenient. We can see why many people travel with a follow car. As the evening falls we enjoy a beautiful sunset over the mountains. The colors over the desert are incredibly marvelous. Weather: A smile of sun and a wink of wind. We pack up as soon as we can. We're going to the west side of Phoenix today. 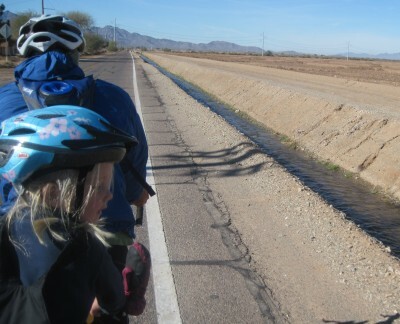 Our route takes us through the Gila River Indian Reservation. It's dry desert with only shrubs as vegetation. A motel room is waiting for us in Avondale. Thanks Steve and Beverly. The moon is fading in the morning light. It is hard to believe we're within 20 miles from Phoenix; as the bird flies. There is barely any traffick on our route. The road is easy to follow. It curves around the South Mountains. We take a break in the little town Komatke. Not quite halfway, but a good way. When we leave Komatke we can see the town on the horizon. There are more junctions and there is more traffick. We get off the mainroad and head west a little further. Where the road ends we head north before we turn west once more. This zigzagging leads us through more irrigated fields. Between a couple of them we find a good place for a break and a picnic. It isn't long or Wâtte finds us here too. He's already checked into the motel and unloaded everything from his car. Tomorrow he'll fly out again. Today we still get to spend together. 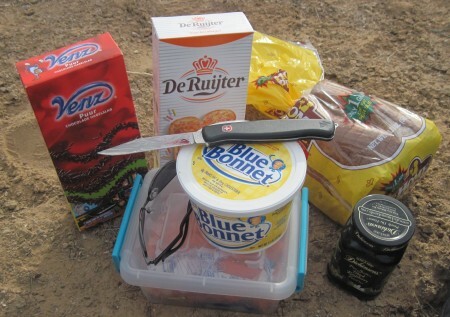 Time for a picnic between the irrigated fields. Picture by Jasmine. 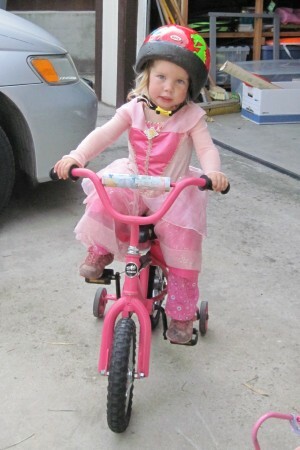 After the picnic it's Wâtte's turn to ride the bicycle again. Just with Bill this time. 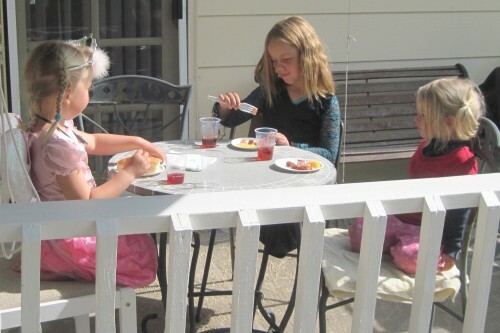 Amarins takes the girls to the motel so they can get ready for supper tonight. We're having supper with Carol. She's our first sponsor of the journey. We finally meet our first donor Carol of Phoenix. Weather: Just right for swimming... outdoor. 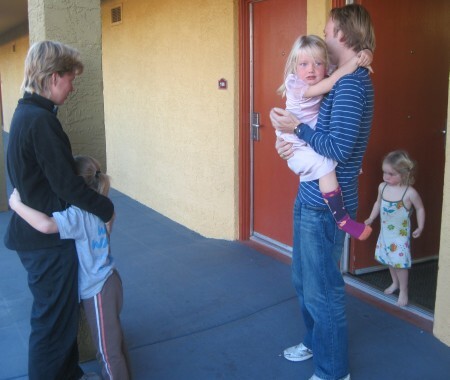 Today is the day that Wâtte is going back home to the Netherlands to his wife and children. It's been great to have him with us and to share this part of the journey. We've decided to stay another day to rest. 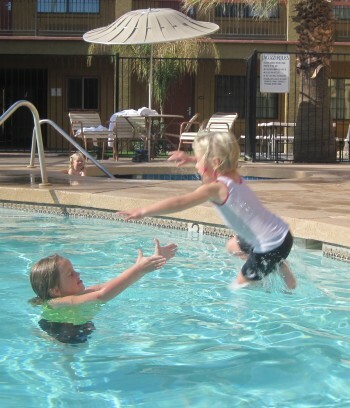 Swimming in the outdoor swimming pool. Just warm enough. For extra fun they hop into the hot tub too. Supper with Jean and Chuck Magley. They are just as warm as their relatives Scott and Katie in South Carolina. We're all ready to go. Everything is loaded. 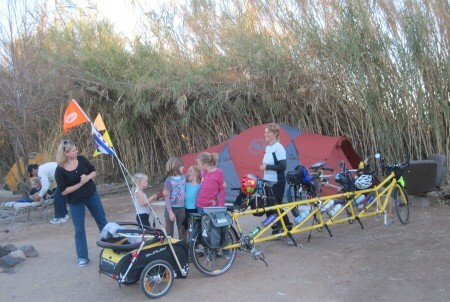 The tent, the panniers, the sleeping bags, the mats. We're good to go. All we need to do is fill up the tires. They always seem a bit low after a day off. 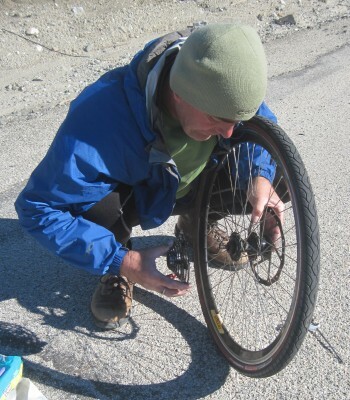 As Bill fills up the front tire he sees a crack in the rim. Closer observation makes him realize it is cracked all the way around. There will be no riding today. 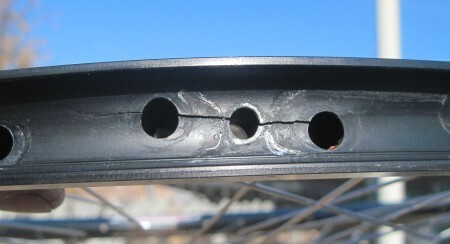 A broken front rim results in extra rest days in Phoenix. We can stay with the Magleys. Robin is racing around the parking lot. We're having the day off again. Bicycle stores in the area don't have the kind of rim we're looking for. Thus we call Lyle at Spin Lite Cycling, he's right on it. We'll have a new rim tomorrow. 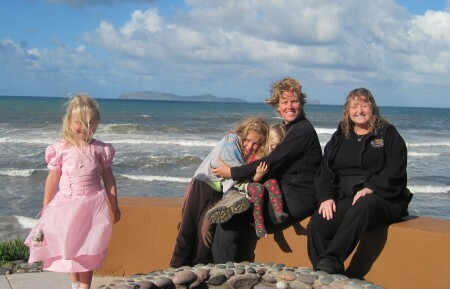 As we wait for the new rim to arrive, the girls are having a great time playing with grand daughter Audrey. 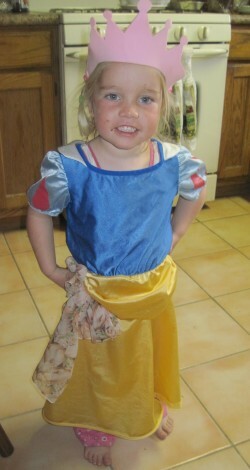 Playing dress up and having a tea party are great fun. 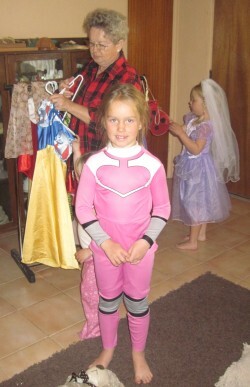 Cheyenne as ehhh... the pink girl? 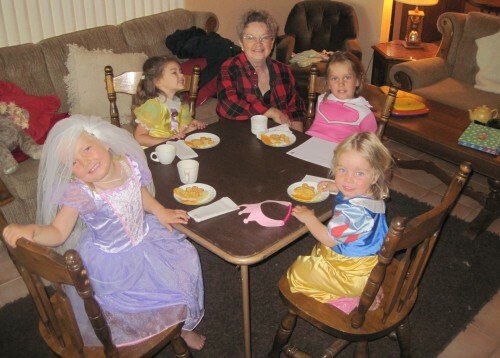 Four princesses with the fairy grandmother. Time for a teaparty. We're lucky that Bill saw the cracked rim. The rim is broken worse then we thought. Another problem solved. The new rim is on. The bicycle is ready for travel again. And so are we. We enjoy being on the road. It is the problems that sometimes wear us thin. Once solved they become a distant memory, they make us stronger to continue our path. Thank you Jean and Chuck for having us with you! The Magleys bring us back to Avondale. We keep south of I-10. There is a paved road all the way to exit 81. There we will cross the interstate. 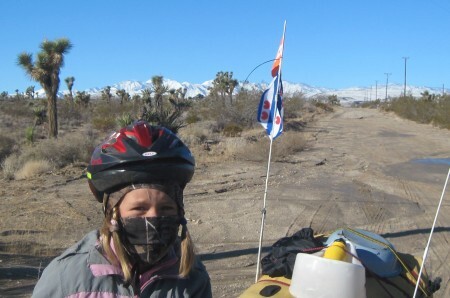 Riding thruough the Harquehala plains we'll arrive in Salome later this week. We'll be back on highway 60 again for a little while this time. We have the details of our route written out by Gill. We met him at the Quality Inn a couple of days ago. That was not a coincidence. His friend Fred from Atlanta, Georgia has been following our journey and let Gill know we were in town. Thanks Fred! We zig zag our way to Yuma road. On our way we pedal through a speed check. It actually registers our speed at 9 mph at that time. Pretty good. The weather is nice. 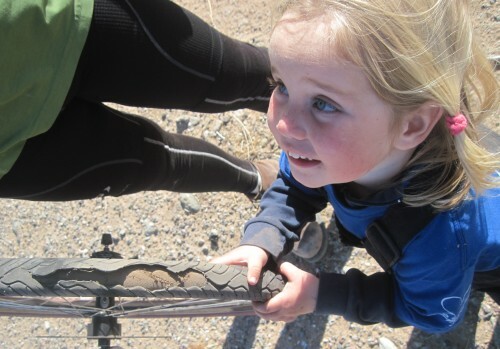 We're thankful for finding the broken rim before we're entering the more remote areas of Arizona and California. When we leave Buckeye we leave the city behind for sure. Less and less traffick on the road. The avenue numbers keep adding up. We pass 156th avenue. Our aim is to get to 411th avenue, near Tonopah. The road is steadily rolling up hill. It's nice to be rolling. 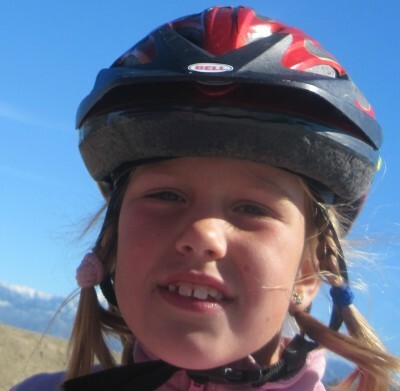 It is easier to go up hill and then a little downhill cruise, than to ride more gradually up the same elevation. Arizona mountains after mountains after mountains. We take a brake at the Wintersburg grocery store. Here we meet a cheerful young lady. She's very excited about our journey. A couple of miles further down the road we see her again. 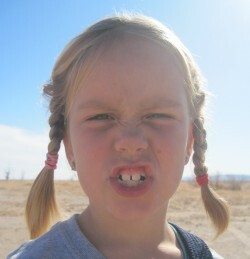 Since we are fairly close to Tonopah, she advises us to go to the Tonopah Hot Springs. We can camp there too. Better yet, she'll drive ahead of us and arrange a site. The thought of soaking in a hot springs gives us some energy to make it the last miles. We do stop from time to time to catch our breath. We haven't travelled fully loaded for so long, we feel quite out of shape. Karrilee and her daughters Sydney and Riley are showing us the campground. The girls are having a great time playing tag with Riley and Sydney. In the mean time we set up camp and talk with Karrilee. What a delightful visit. So lively, full of energy and bright. Thank you for your gift of being you. The day is not over yet. We are going out for supper with Gill and his wife Lily. We can choose between Subway, a Mexican Grill and a mom-and-pop diner. We choose the latter. There is something for everyone. Like usual the girls are all over our hosts. Supper with Gill and Lily. From 7 to 8 pm we have an entire bathing area to ourselves. Just us and the hot water. It feels marvelous. Good morning! Are we rested! Yes we are! We fell asleep so hard that we didn't even hear Karrilee coming back with ice cream. She even hollored for us. What's for breakfast? Sprinkles on bread followed with icecream! That's the way to start the day. We're still enjoying the sprinkles for breakfast. We are very slow at getting started this morning. The girls have found a little bicycle. Bill puts some air in the tire and it's good to go. 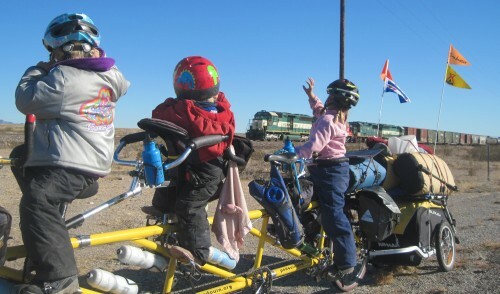 Even after all these miles they still enjoy riding a bicycle. Cheyenne has not forgotten how to ride by herself. Jasmine needs a little help and hasn't quite got the confidence yet. Robin can handle it pretty well, with Amarins holding the seat. She spins the pedals and steers it wherever she wants to go. We turn our back to the interstate and ride the extra two mile to Salome road. Going the way we are going it takes us 7 more miles to arrive at exit 81. But at least we don't have to ride on the interstate. The road we're on is pretty good with little traffick. We have more time to look around. By doing so we find a beehive in a tire. 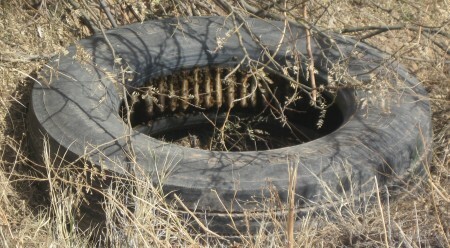 A tire on the road side forms a good beehive. For several miles we climb up a steady grade. We can see the interstate from up here, but don't hear the noise of it. It's a pretty ride. We are amazed at all the mountains that keep showing up on the horizon. We didn't know this part of Arizona was covered by plains and mountains. 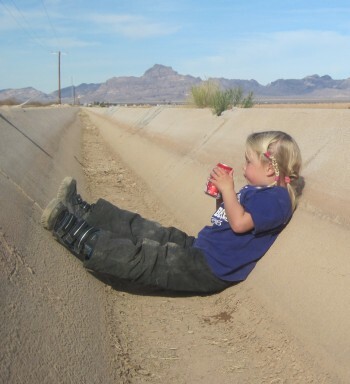 Jasmine is taking a break in an irrigation canal. Just right. Just a couple of miles before the interstate we have a break. Three fellows in a car have brought us some cold cokes and a bag of chips. The men are retired and are roaming the countryside for old cars. In this low himidity climate old cars barely rust at all. From time to time they find a nice one. Jasmine is checking the sign. We're getting closer and closer to California. On the north side of the interstate, the irrigated fields stop and the shrubbery desert begins. It is the desert in its natural state. The girls are wondering where the cactus are. Well, they are not part of this desert. At least not as we can see it from the road. We are to low in elevation for the tall saguaro to grow here. A lunch spread fit for a king. We've been climbing most of the day and our legs can feel it. We were hoping to make it within 10 miles of Salome, but that is definitely out of the question now. Maybe another 10 miles, but then it is time to stop. It will be a desert camp tonight. 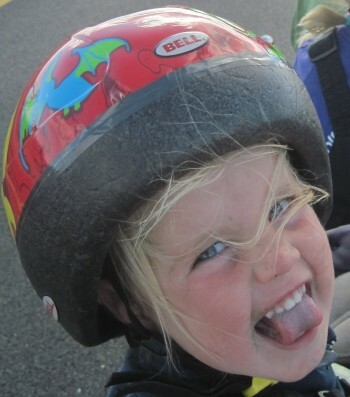 While we are riding we keep our eyes open for a place to camp. 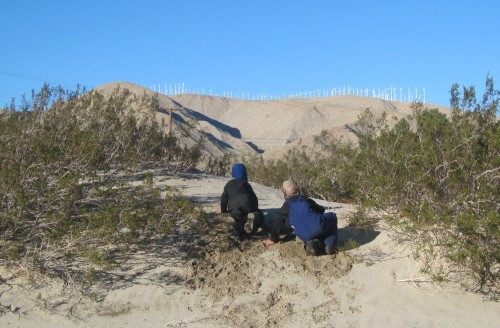 We decide on a site behind some taller desert trees. We don't know what their names are. They look like the mesquite we saw in Texas. We find a fairly flat spot and start setting up. The girls wander off in the desert. 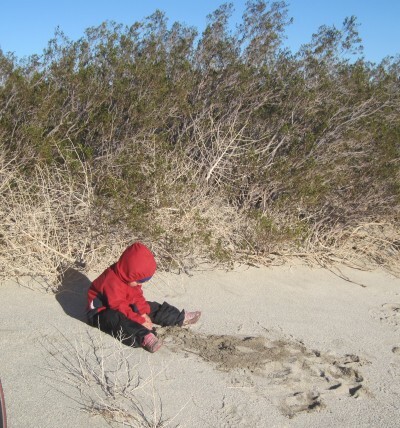 They follow little washes and explore the area. They finally settle down to dig a hole for a pretend camp fire. Robin decides on building a playground. Playing together with what nature provides. Robin has build a playground out of sticks and rocks. We settle for a cowboy wash up before we crawl into the tent to call it a day. From the opening of the tent we enjoy a colorful sunset on the mountains. Getting ready for bed as the sun has set on the horizon. 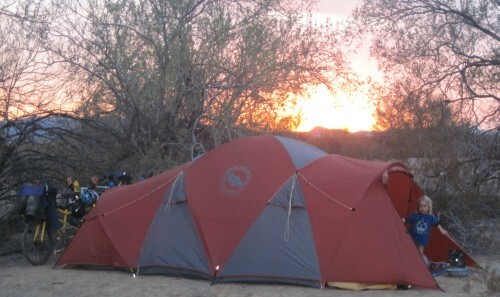 Sunset over the Pedouin camp on the Harquahala plains. 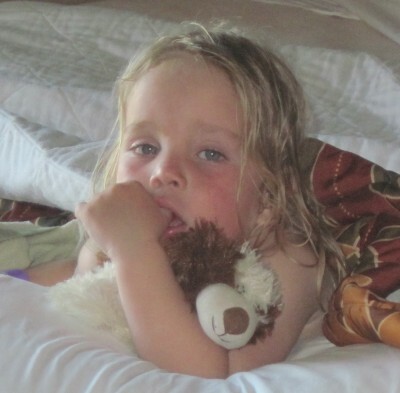 We went to sleep with the yiping of coyotes. We wake up by the sound of prairie birds. The sun slowly rises over the mountains, giving the mountains yet again a different look. It's a bit cool, thus we let the sun warm the tent before we really get up. Time to hop on pop. When we are finally on the road we see a small campervan parked in the desert. 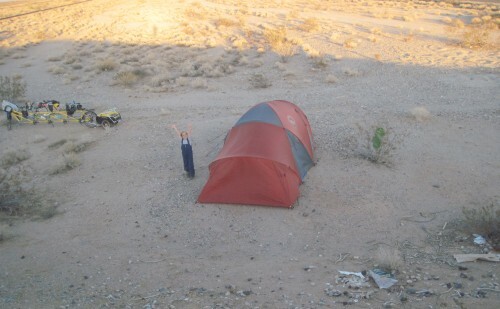 Apparently we were not the only ones to camp under the stars. We slowly continue our way. We can't quite get in a rhythm. The chain crunches and crunches. The road keeps on rising. Slowly, yet steadily. Crunch crunch crunch we climb up the road. It doesn't make for sunny moods. Bill is frustrated with the bike. Amarins is frustrated with Bill for not shifting better. The girls are frustrated with us for being frustrated with each other. We bite our tongues and keep on going, as we try to make it to Salome. 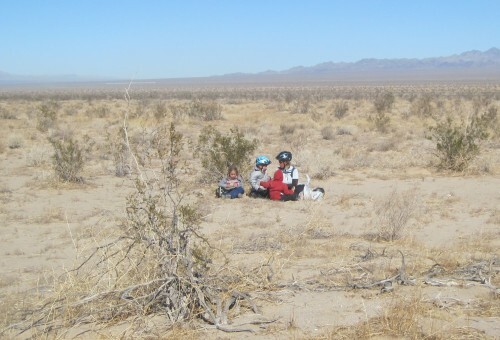 With less then 15 miles to go it is time for a lunch break in the desert. We have bread with us for sandwiches. It's good filler. A coke, some carrots, some chips. It's as good as it gets today. We rest a little longer. The girls play with nature. This saguaro shows a rare wave misformation. Without much talk and with much todo we finally arrive in Salome. Worn out and hungry for good food. We find the latter in the Salome Restaurant inside an old adobe building. The building breaths a warm and welcoming athmospere. The girls choose to sit at the bar, so we all do. The food has done us well. Amarins and the girls relax a little longer in the restaurant. Bill is exploring the town to find a place to camp. He finds a place at the Shefflers Inn. A small motel across the street. They help us out cost wise and allow us internet access. Finally another update! Another day, new chances. Bill is not taking chances this morning. He's lubricating the chains in the hope of stopping the crunching. 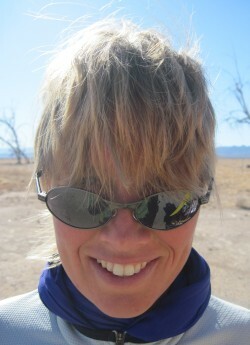 Perhaps the dry and dusty desert has its effect on the wear and tear of the bicycle. At the same time the girls are playing outside and Amarins is packing everything back on the trailer. We do all have our parts to do on the journey. It has come about somewhat automatically. When we're set to go we head across the road to the restaurant for breakfast. We order two pancake meals; each excisting of two pancakes, two slices of bacon and two eggs. Robin wants a pancake, Jasmine thinks she can eat two. Cheyenne goes for the eggs and bacon, as does Bill. Amarins takes whatever else is left. It works very well. We all get what we feel like eating in combination with what is available. Jasmine at the Frog restaurant in Salome, AZ. Robin is making sure everything is ready for the arrival of breakfast. 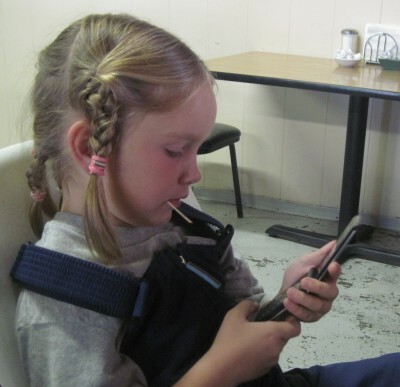 Cheyenne has figured out how to text. It rides so much better with a good breakfast in our bellies. The lubrication of the chain also seems to help. We can't hear or feel it crunch anymore. We didn't realize what a mental battle the pedaling is, but now that we've had a crunchy day like yesterday, we know it is mostly mental. We ride out of town on highway 60. The same highway we road on in New Mexico and were planning on taking all the way across. How quickly plans can change. Today we only travel on this highway for seven miles. Then we turn on SR-72 in the direction of Parker. We have once again new plans. 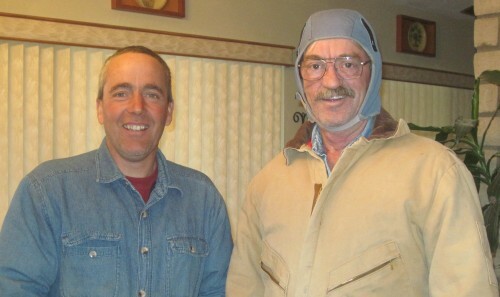 We are going to visit a childhood friend of Bill; Dennis in Yucca Valley. 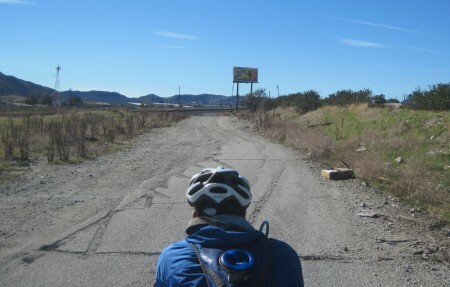 From Parker it will be a straight shot on California road 62 to Yucca Valley. From there we'll find our way down to San Diego. For now we are still in Arizona. A couple of miles climbing and then a long down hill stretch. Fly girls fly. We woosh down the hill with the wind in our hair. These are the easiest miles since... well a long time ago. 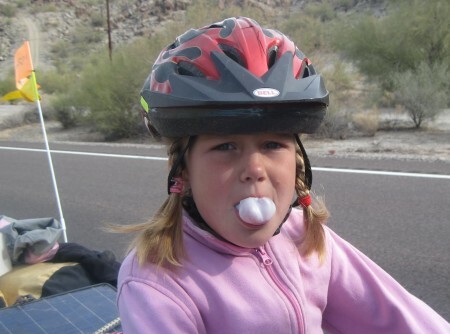 Cheyenne is practising her latest skill: blowing bubbles. We turn off highway 60 at Hope and keep on the high side of the valley. We still slowly go down the hill, but it is more gradual now. It doesn't slow us down much. We push extra hard at the little uphill stretches. It just feels great today. We've already done over halfway to Bouse when we finally take the time for a long lunch break. We find a wide spot along side the road to do so. 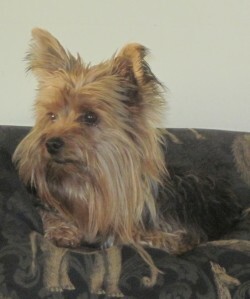 Can't wait for my haircut in Nanaimo! Bill walks the bike around so we can make it the final miles to town. Everybody on! 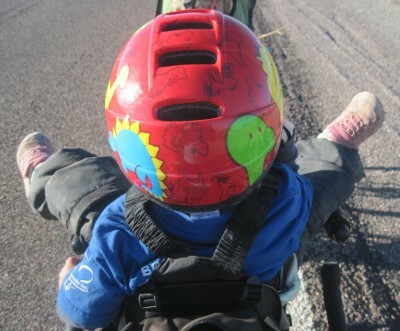 Robin can climb in her own seat now, as long as she doesn't wear her helmet. Now she is also part of the 'me first' crowd. We will have to set up a schedule including Robin soon. With everybody on and secured we find a lull in traffic and start across the road. 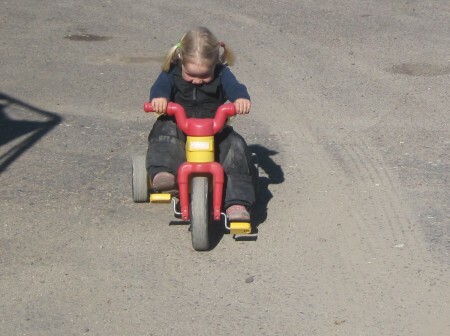 We push down on the pedals and are halfway the lane of oncoming traffic, when the rear wheel blocks. There is no moving it forward or backward. Traffic is getting closer, there is only one thing to do. Everybody off! Emergency! We drag the bike to the side of the road just in time. This was a very scary moment. The scariest part of it was the big truck that was not planning on moving over one inch. Thanks for adding to the anxiety of the moment. We bonjour the girls to the far end of the wide spot. We unhook the trailer and take everything off the bike to figure out what has gone wrong this time. The chain is totally wrapped around the rear wheel, between the hub and the sprocket. Plum stuck. Bill needs to take the chain apart before he can take the wheel off. Then he can start on freeing the chain. "This tire is broken Daddy!" Dragging the bicycle out of the road caused the already worn rear tire to give it up totally. We have a little under 600 miles on it. Not bad though. We're carrying spare tires, so that part is quickly fixed. It looks like the rear hub is locked up again. We don't have the free wheel possibility anymore. How is it possible that everything can go so smoothly in the morning and be totally locked up by afternoon. We are just dumbfounded. It doesn't make any sense to us. We will have to milk it to town. In Texas we had a moment we needed to ride without free wheeling, we know how to do that. 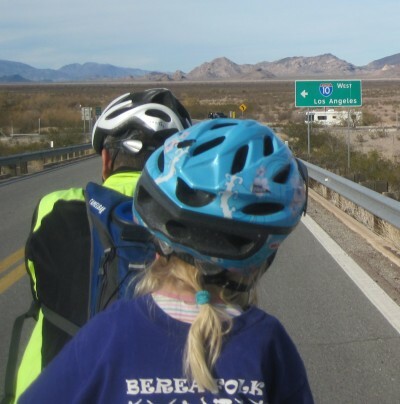 If we can make it to Parker tomorrow the bicycle store there might be able to help. It was chilly last night. When the sun hits the tent the condensation slowly drips down. We dress warm and start the packing process. We are anxious to make it to Parker. Perhaps we can find a solution to our hub problem. 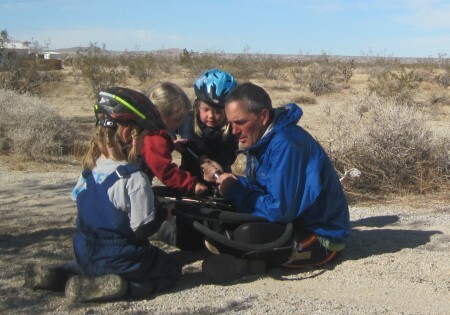 Bill has talked to the middleman we bought our bicycle through. He suggest the hub must be gummed up. For the rest he doesn't know it either and offers no help. He's made his sale. That's what that was about apparently. We follow a train track once more. Today we are in luck. One train passes us by. It is the Arizona-California line. We wave in the hope it will blow its whistle, but it doesn't. Robin was prepared though. She had her ears covered. Smart girl. Our first train in Arizona. The Arizona - California line. Eleven miles into our day we take a most important break. We have covered 3,500 miles of our journey. The official halfway point. It is a point of mixed feelings. We've had an incredible journey already. Meeting wonderful and joyful people along most part of our journey. The other side of the mix is a stack of bicycle problems. 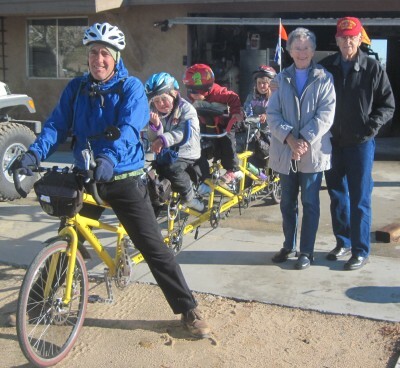 Reason says our problems will only increase as the journey progresses and the bicycle ages. We've had a lot of problems already and have overcome most of them. What else can we expect? Only a continuation of the journey can tell. 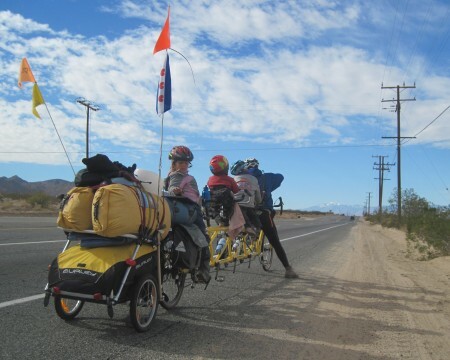 These girls have traveled 3,500 miles on a five person bicycle, touching the Atlantic Ocean, crossing several rivers, across 12 states. We are very proud they are our daughters. The road intersects with highway 95. It is snowbird season. And there are many of them. They all seem in a rush, barely giving us space. Not a very good road to be riding on with all this traffic. 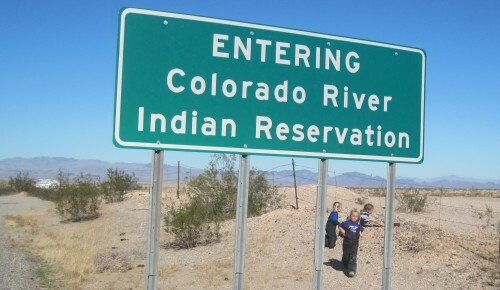 We take another break halfway the inersection and Parker, just after we enter the Colorado river indian territory. The mountains ahead are part of California. The road we are on slowly works its way down into the river valley. The final couple of miles is a long stretch into town. The bicycle shop is easily found. Bill will stop by there later or perhaps in the morning. For now we get something to eat and head for the playground. Perhaps we can camp there tonight. Ready to go to the playground. Let's go! There are three little girls already playing at the playground. Instant buddies. Cheyenne thinks she can make the rules, but the oldest of the other girls puts her back in her place. Cheyenne is not the oldest now. 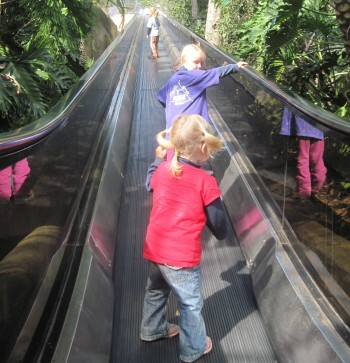 They play on the slide and on the climbing devices. Robin of course can be found in the swing. Bill takes the bicycle to the shop while the girls are playing. At the shop he takes the wheel apart. It is totally clean inside. So that is not te problem. Perhaps some new oil will help. It looks like that is helping. By advice of the repair man Bill gets a new drive chain and has a couple of links taken out. The advice is that our chain is too long. Bill gets the feeling this is a mistake after riding it to the playground. We load up and ride to Walmart for supplies. 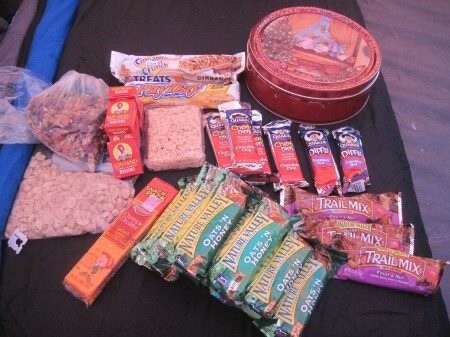 Granola bars, water, bread, canned fruit, candy, a number 5 candle. We're all set. 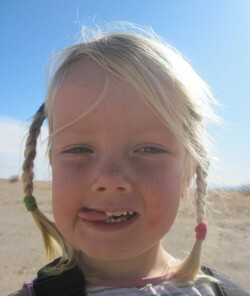 The plan is to go to the river and camp on BLM (Bureau of Land Management) land. Good plan. But it doesn't work. The new chain is locking the derailleur up. The links that have been taken out need to be put back in. So there we are, hanging out in front of Walmart. Waiting for the repair man to bring us the missing links. Seeing the sun setting on the horizon. It is getting dark quickly. We check in Walmart to see if it is alright if we camp in the empty lot next door. It is. Thank goodness. At least we have a place to camp. As the repairman works on the chain we set up camp. There are several huge streetlights brightening our campsite. 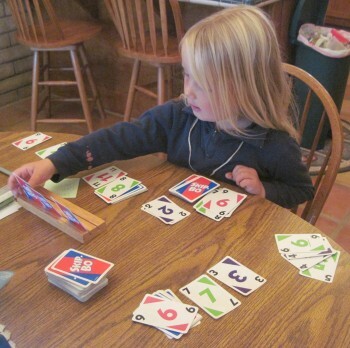 So bright that it is light enough in the tent to play some cards. With the bicycle put back together we call it a day. And what a day it was again. More excitement then we care for. We decide to stay the day in Parker. 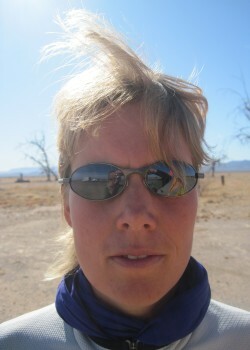 We are taking the day off to rest for the big desert crossing. 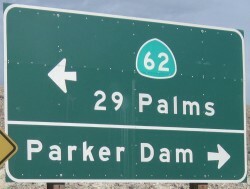 From Parker to Twentynine Palms in California there will be no places to take showers or rest in a comfortable bed. Let alone a place to eat or fill up on groceries. A 110 mile stretch of desolation. We are going to stay at the BlueWater Resort & Casino north of Parker. An extra mile out of the way, but cheaper then the other motels. And it has a swimming pool! 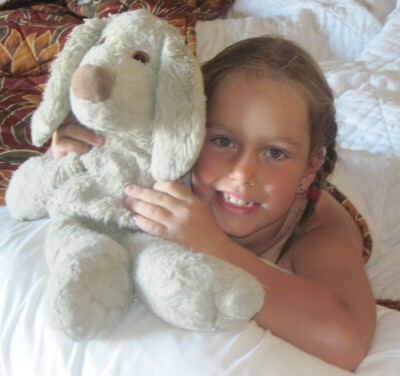 An extra special stay because tomorrow is Jasmine's 5th birthday. She'll have her birthday in two states. And on top of that, due to the change in time zone, her birthday will have 25 hours in it! With everything loaded we try to take off. Crunch crack slip. The chain is missing the beat. With the push of a feather we finally get the bicycle rolling. But it is not right. Now what is wrong! We do make it to BlueWater. Pushing as lightly as possible. Bill arranges the room. In the room we immediately change to go swimming. There are several swimming pools. Different dephts and different temperatures. Bill and Robin head for the hot tub. Cheyenne and Jasmine talk Amarins into going down the water slide. And that water is cold. Very cold. We tiptoe to the slide, but once down it we do plunge in the cold water. Brrr. Quickly let's get out. Of course once is not enough, so we do it a couple more times until our lips have turned blue. Then The girls finally surrender themselves to the warmer water. That's better. 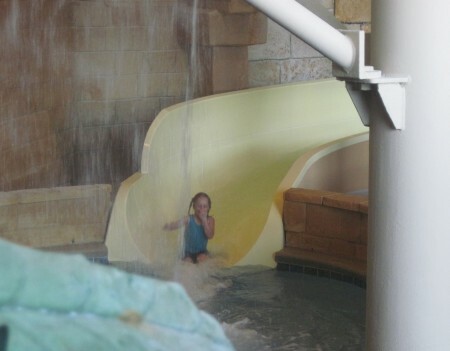 Cheyenne is going down the waterslide. This was only the first round of swimming. This afternoon we'll go again. Now it is time to rest and nap. Amarins will work on the website. Bill is heading back to town in the hope that the old chain is still at the bicycle shop. Not good news. The old chain has already been thrown away. They put a new sprocket on, but that has not helped any. Even the bicycle repair man admitted we should not have come in. The bicycle is in worse shape now then before we brought it in. The old worn chain worked well with the worn front rings. We are so through with everything breaking down. If it hadn't been for the joy and experience the journey brings to us and others, we would've quit a long time ago. The biggest wear on us right now is the cost of fixing the bicycle over and over and over again. If you haven't had a chance to support us, now would be the perfect time. If not; the website will be here for your entertainment purposes. Read these cheers if you need inspiration before you decide to support us. 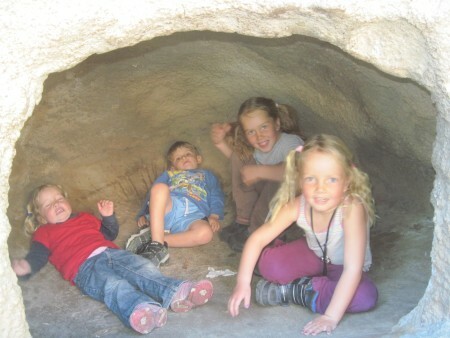 All we know to do is to head for Yucca Valley, starting tomorrow. You can track our progress with the tracking device. Its link is located on the homepage. New front rings, the guts of a hub, other sprocket and drive chain are on their way and will hopefully meet us there. Happy Birthday Jasmine! We love you! A special birthday day today. 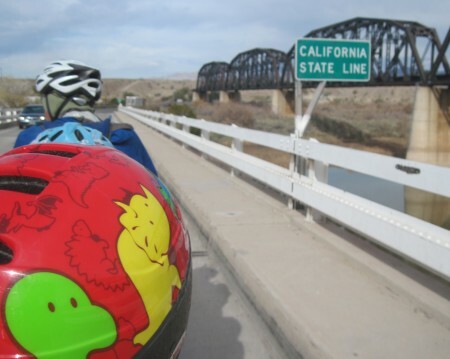 Also a day that we are going to ride into California. Our 13th state on this journey. 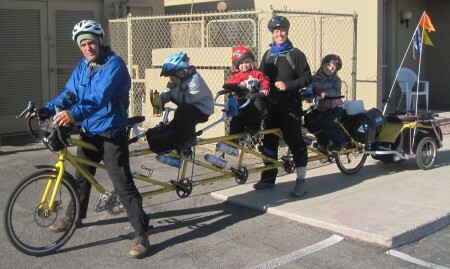 With the bicycle in so-so shape we are going to see if we can make in to 29 Palms and on to Yucca Valley. Once we're loaded we head back into town. 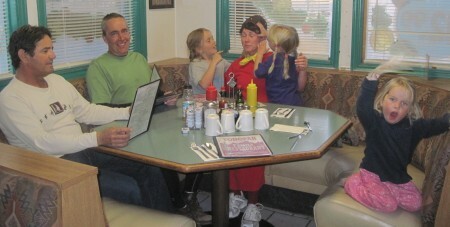 A special breakfast is waiting for us at the Early Bird Cafe in Parker. Bill met the owners when he was in town on one of his bicycle-fixing trips. Especially the girls are all excited. Special birthday pancake for Jasmine. 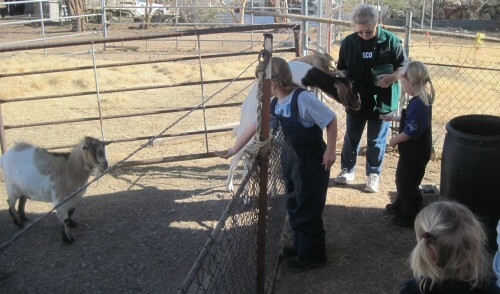 Robin and Cheyenne were also treated on one. We're taking our time and enjoy the warm athmosphere in the restaurant. 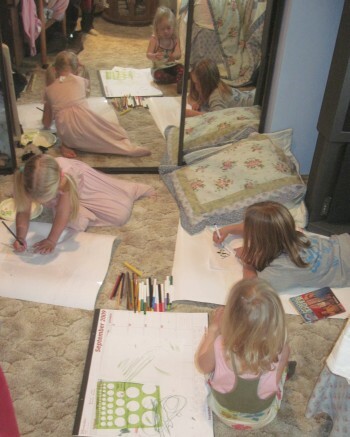 The girls use coloring books and draw up a storm. A couple of pages we take with us for later. 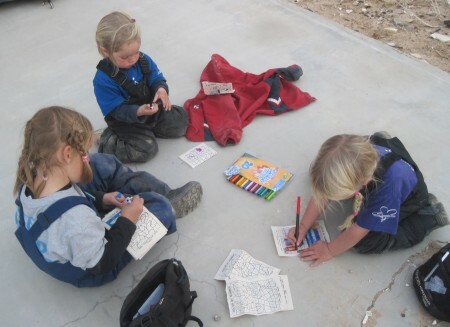 The color-by-numbers is their favorite. 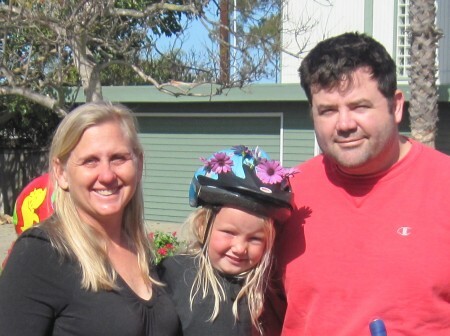 We rode over 3,600 miles from Kentucky to arrive in California on Jasmine's birthday. We made it to the Pacific Coast state. It's hard to comprehend we've made it this far in under 6 months. It's a good thing we travel so slowly so we have the chance to get a feeling for this accomplishment. 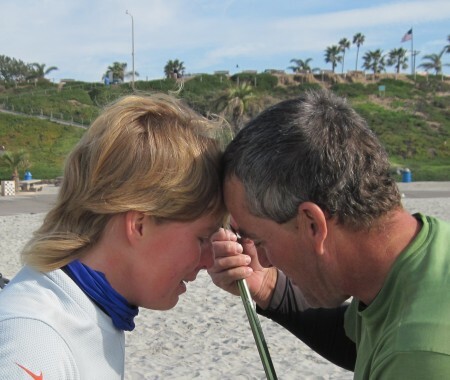 It already felt like a big accomplishment making it to the Atlantic Coast on August 31, 2009. Now the Pacific Coast is within reach it's just overwhelming. There is very little traffic on this side of the river. It makes for enjoyable riding. The road is slowly taking us out of the river bed. We're climbing steadily. The middle gears don't work to well, but keeping it in low helps us get further and further inland. Well, so far this works. 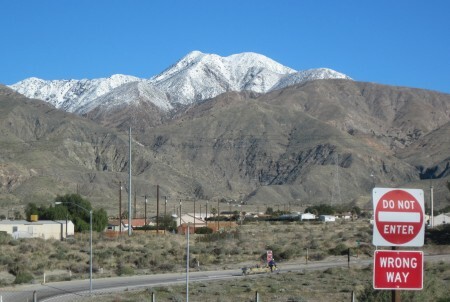 Our next town is 29 Palms; 109 miles away, crossing mountains and desert. Over a 1,000 feet of elevation behind us. A wide spot in the road is a good spot to have a break. We climb the hill and see the town way off in the distance. The hill we're on is a great place for a break. There are rocks all over the place. Not for climbing, but for building. Cheyenne and Robin are working on a sheppards memorial. And off we are. We meander our way through the rolling rocky hills. The landscape on this side of the river has more rocks. Rocks of many different colors, from black to white, from red to green. Especially the green ones are new to us. A geology course would have come in handy to learn more. We ride on till we arrive in Vidal Junction. This is where we load up on more water and food, snacks mostly. Bill decides to exchange the tire on the front for our last new tire. The old one is about to tear apart, not something we want to deal with in the desert. We have a nice long break before continuing our journey west. The weather is good. No need to bundle up. Just right. As the afternoon progresses, the wind is picking up. And it is coming directly from the west. It's going to be a trick to put the tent up in this wind. There are no trees or big bushes to shield us from it. When Bill sees an abandoned loading ramp for the train, he decides it's a good windbreaker. The girls explore the area and find more rocks to build towers with. They also build a fire pit with a rock wall to shield the (pretent) fire from wind. Very clever. Jasmine builds several birthday cakes with sand and rocks. One has a smily face on it. After a simple sandwich supper we have a birthday cake with a candle. Jasmine gets to eat the entire cake all by herself. 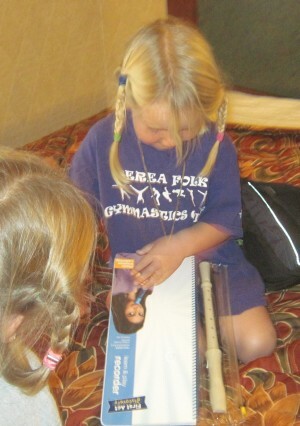 Afterwards she pulls out her new flute and practises with it. It's been a good birthday. 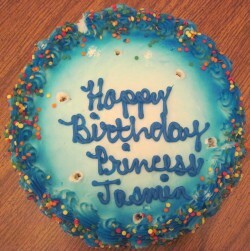 The entire cake is for Jasmine. Weather: Sunny with a smile. Several trains came by last night. It's as if they were riding through our tent. The entire ground was shaking. Yet the kids didn't notice a thing. When they sleep they sleep. Looking for smashed pennies on the rail road track. There is little wind this morning. The little there is is coming from the north, north east. Time to load up and take advantage of it! No matter how fast we work it still takes over an hour to get on the road. The road paralels the rail road track. 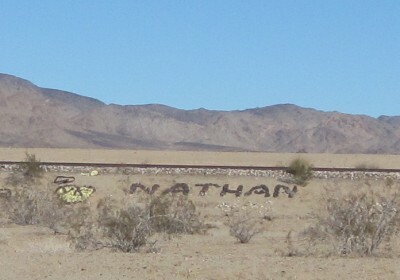 Many names are written with rocks on the side of the elevated track. Among the many names we spot the name of Cheyenne's friend. The road rises and drops. It takes us in a relatively straight line closer to the Iron mountains. It's hard to tell how far away they are. The sand in the air makes them hazy on the horizon. To the north we see more sand in the air. It's a sand storm. The wind is so strong, it's blowing the flags over. The road signs warn for drifting sand. Cheyenne wonders what it means. As we get to the lowest point of the stretched valley we learn. The sand is blown across the road. It forms a sand snake over the ground. The wind has picked up in strength and is coming more from the north now. It's pushing us forcefully from the right. With our backs against the wind, to protect our sandwich from the sand. A break like this doesn't take long. 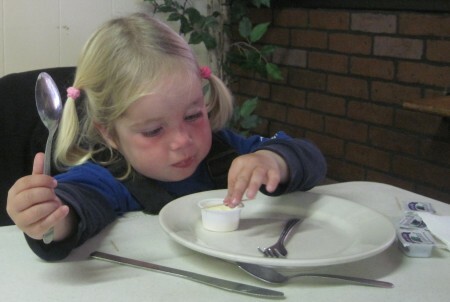 We move on quickly after we finish our food. Bill didn't even get a chance to sit down. The wind would have pushed the bicycle over. After this quick lunch Robin takes a nap. She doesn't sleep as much any more. 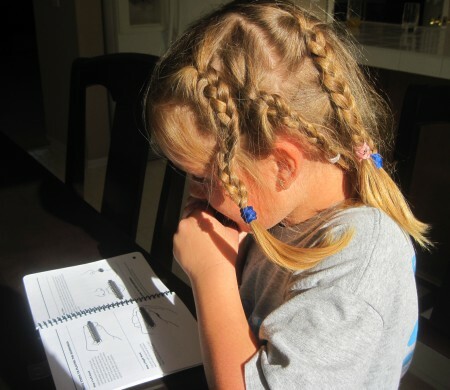 Our little girl is growing up. All of them are. When we reflect upon the past five months we have seen them change and mature a lot. We understand that the same would have happened at home. But would we have noticed it as we do now, or would we not? After a steady climb, we crest between the Granite and Iron mountains. Off in the distance we see a valley where the mountains have been swallowed by sand. It's an erie yet beautiful sight. A road runs through the valley. A road, we soon find out, is the road we'll be taking towards town. We actually are going to get a closer look of the valley. The road is going to take us into the desert. Due west we go. Between the mountains the sun will set quickly. Time to find a camping spot. We see two tiny hills in the distance. That's our goal. The first four miles are free miles. Down down down the hill we go. It's always very rewarding. We have to keep on pedaling so we don't lock up the rear hub. This works very well. We climb for just a couple more miles to be out of the flood zone. We don't make it to the two little hills. We'll save that for tomorrow. 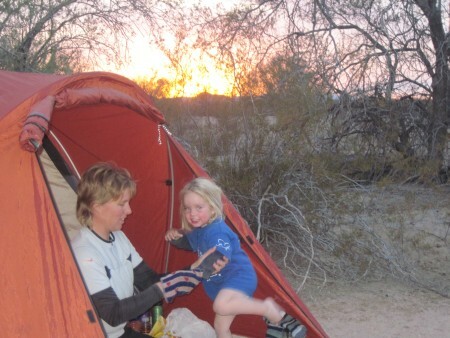 We set up our camp in Cadiz Valley at the foot of the Coxcomb mountains. Tonight we won't put the outer fly on the tent so we can look at the starts as we fall asleep. Weather: Sun in the east, clouds in the west. What a night. Falling asleep by the light of the stars. Waking up at the first rays of light. It is so silent here, not a sound reaches us. Not even the howling of a coyote. Magnificent. Good morning! Wouldn't you want to wake up to this sight every morning?! When it's warm enough for the lizard, it's warm enough for us. We pull our belongings out of the desert, back into the road. We have a climb ahead of us. We're curious how far the two little hills - our aim yesterday - are away. With the late afternoon light distances can be much farther then they seem. The girls found a lizard 'stuck' in a can... Initially they thought it was dead, but once it warmed up a little it turned out to be alive. We start in our lowest gear and stay in it for the next 10 miles, or three hours... We pass the two rock hills. They are very well disguised. We don't see them until we're upon them. They were 4 miles from our camp. With the light not shining from behind them they were barely recognizable. The wind is not blowing right now. What a difference that makes with yesterday. We're going maybe 4 miles per hour. But we're making it! Each time we stop we look back and can see the incredible climb we've made already. When we think we're going to crest, there is yet again an elevation to climb. A lot of rewarding hard work. And we keep on climbing. 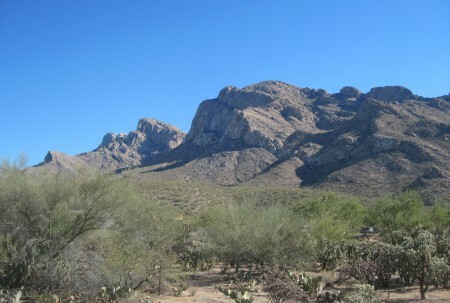 The Iron and Granite mountains are on the left and right in the back. The pass is still somewhat visible. We figure we climbed at least 1,000 feet out of Cadiz valley. We're taking a long break when we finally make it to the top. The girls are walking the washes. They climb rock after rock in total freedom of exploration. They walk hand in hand. Helping eachother. A sight so sweet and special. Bill decides to take no chances. We're at a wide spot in the road, almost a rest area. It is a good spot to wave some campers down for an extra gallon of water. We're making really good progress. Still, to have some extra water won't hurt. And it works! Thanks for stopping and filling up our water supply! Refreshed and refilled we continue today's ride. It's downhill time! It starts at milemarker 69 and doesn't really stop till milemarker 53. We are setting a record for sure. The road curves sharp to the south. In the curve we can see through a V-pass to the west. We can't believe our eyes. We see snow covered mountains! Wow. What are we getting into now? The snow covered mountain dissapears from our sight, but not from our minds. The girls are wondering if we're going to be in snow again. We don't think so. The snow is probably high on the mountain. Right now we're feeling the wind in our faces from going down the mountain. The road eventually curves back to the west, where we pick up sight again of the snow covered mountain. The downhill ride was lots of fun. Now it's back to pedaling. It starts gently rolling. Followed by more climbing. When we find an abandoned slab we decide it's a good spot to build our camp. Tomorrow we'll have breakfast in town! A good table for coloring while it is still light. Weather: A cloudy day with some bright spots. Clouds in California? That's weird. We simply assumed it's always sunny here. We still have the hoodies and bring them to good use again. Just to get the morning chill off. We estimate it is less then 10 miles to breakfast. It turns out were right. A little up hill, a little down hill and then we're in Twentynine Palms. 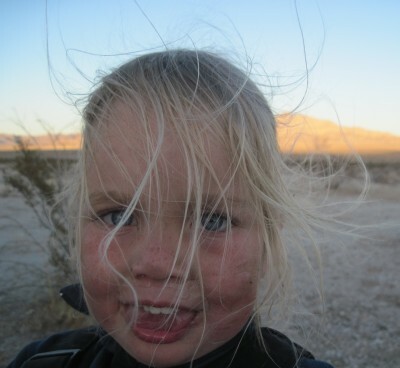 We crossed a hundred miles of desert, with thousands of feet in climbing. 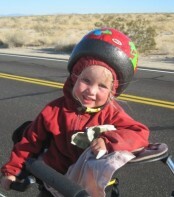 When we left Parker we didn't know the bicycle would hold up and bring us all this way. It did. What a boost to our energy that is. Both a relief and an inspiration. Breakfast at Pete's. Totally relaxed and flavor savouring. A cup of coffee, chocolate milk and juice to go with it. We're taking our time enjoying our victory. That's what it feels like. We are capable of incredible achievements. These past couple of days is one of them. Next stop Yucca Valley. We're back to climbing. But nothing can deter us now. A 1,000 feet of climbing seems easy now. And it isn't all a gradual climb. It goes up and a little down, more up and some down again. This is how you do it. You keep on going until you get where you want to go. Pedal pedal pedal. Mile after mile after mile. A road side shot with the snow covered mountain in the distance. We are getting closer. And just when you think you get to your destination... flat tire... So you stop, enjoy the scenery and fix the flat. And on you go again. If it's what you really want you will keep on going. A flat tire. The girls take turns filling the tire with air. 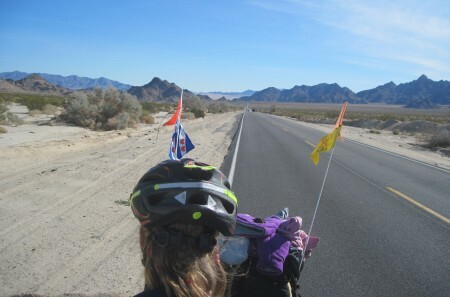 With flat 19 behind us it is several more miles to the town of Joshua Tree. Also here they love their ultra large city limits. It takes several more miles before we find a Subway and take a real lunch break. We meet an abundance of nice and interesting people there. Very enjoyable. From here we call our host Dennis. Only three more mile to the turnoff. They'll come and pick us up from there. 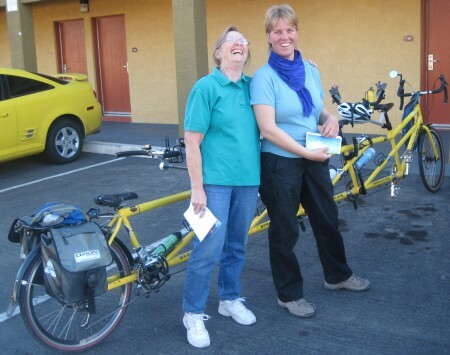 We load the bicycle in the trailer and fill Tami's car with our other things. It is still several miles to their home, part of them on dirt roads. We accept the ride gladly. We've pushed and made it. We'll have a couple of days of rest now. 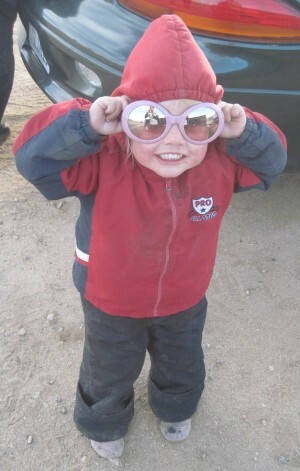 Robin is totally in fashion with her ultra large sunglasses. A week of epic storms over California. Everyday rain. Snow even on Thursday and Friday! We have a mandatory rest week. Not so bad really. Thanks for having us this week Tami and Dennis! We really appreciate it. 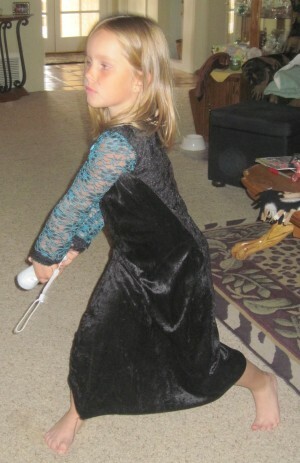 Cheyenne is playing Wii tennis. 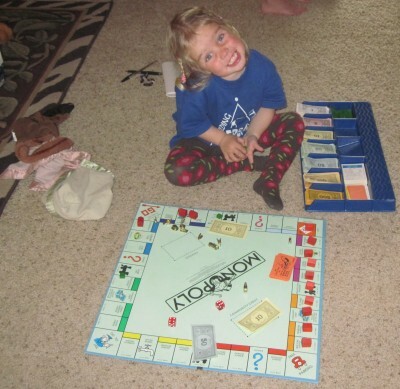 Robin has a monopoly with all her hotels. Even the jail has a hotel on it. 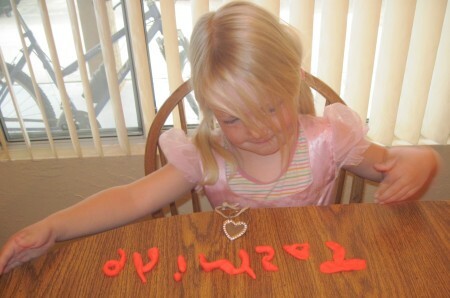 Jasmine spelled her name with play dough. 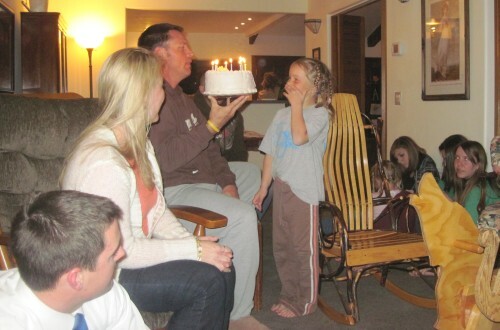 Surprise birthday party! 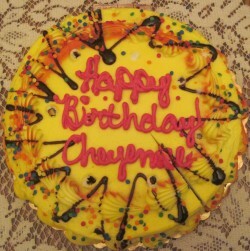 A cake for Cheyenne and a cake for Jasmine. 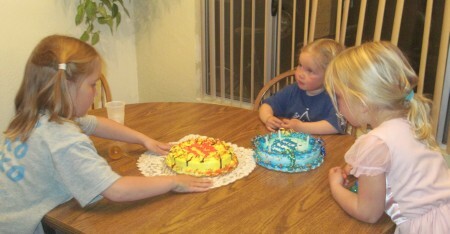 Cakes for Cheyenne's birthday next week and Jasmine's birthday past week. Jasmine is playing by herself against herself. The weather looks good to go on Saturday. Our route will take us south to Palm Springs, before heading West to Banning. This detour will decrease the number of miles we need to ride on the interstate, reducing it to 2.3 miles on Sunday if all goes as planned. From Banning we keep going west to Beaumont before taking the southern road on SR-79 towards Temecula and eventually Escondido. From Escondido we stay east of I-15 before taking SR-67 into Santee and San Diego. Estimated arrival at the Pacific Ocean? January 31, 2010. Exactly 5 months after putting our feet in the Atlantic Ocean at Folly Beach in South Carolina. Thank you to everyone that have helped keep us safe and keep us on this journey. Thank you for your moral support, your prayers, your cheers. Thank you for a roof over our heads, a meal in our bellies, or the funds to help us with both. Thank you very much. We couldn't have made it this far if you had not been a part of this journey. Weather: Wonderfully sunny with a fierce headwind in the funnel. A week of rain, snow and rest. Who would have thought of that happening here in California. Well, it did, and we took advantage of the opportunities because of it. 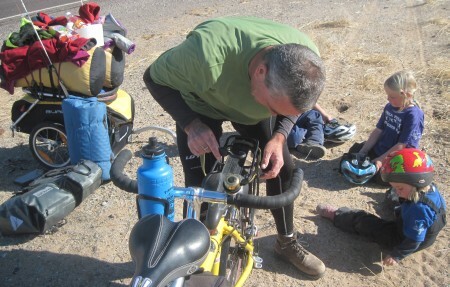 Bill has been working on the bike; putting new chain rings and new hub bearings on it, countless of fine tunings, renewing the handlebar wraps for the girls, making an extension for the mirror. The girls have enjoyed the comfort of a real home once more, with tv, wii and books and games. Amarins has been working on the website. Today the sun is shining. It's not too warm, so time to dress up again. Hoodies, mittens, coats and skipants. Bulky, but warm. It is by 9am and we're ready to be on the road again. The road is going to take us to the Palm Springs valley; a 3,000 foot drop. World War II veteran Carl and wife Vivian had us over for supper. And it was delicious. Thanks! Thanks for serving. If it hadn't been for you and your fellow service men, we would not have been able to travel the land of the free and home of the brave like we do now. We will teach our children about the Enola Gay. For a downhill day, we sure are climbing a lot. 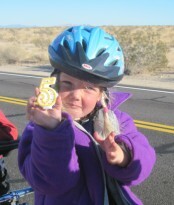 Our starting point was five miles north of Yucca Valley. We chose to go west to highway 247 and take this road down into the valley. But before we get there we need to climb. The roads are fairly clean. There is sand in the washes where they cross the road. It's good enough for biking though. The snowline has dropped to almost 3,500 feet. We're right below it. There are snow covered mountains all around us now. Once we get to highway 247, we're taking the road. There is a shoulder, but it's filled with sand and rock debris. Now we're going down hill. It is very steep. A good thing Bill has checked the brakes before departure. The signs tell us it's an 8% grade. Both Amarins and Bill are holding the breaks. We're using muscles we've never used before. We make it safely into the valley and continue our journey on highway 62. We're going to make good time today. We'll go down hill from here. Right? Wrong. As soon as we're to the edge of town we're climbing again. It's finally dawning on us that the name of the town could be an indication of the landscape. Valley = "A long, narrow region of low land between ranges of mountains, hills, or other high areas...". So because we're in the valley, we need to climb out of it before arriving in the next valley; Morongo Valley. On our slow climb we meet David and Leanne. They ride a quad with their two sons. They saw us last week on our way to Yucca Valley and are surprised to see us here today. Time for an explanation. They invite us for lunch, but with all our climbing we're not as far as we want to be yet. We decide to push on. Only to meet David and Leanne a couple of miles down the road again. With lunch! What a warm gesture. Time for a break. The girls enjoy the company of the big boys. Lunch with quad riders David and Leanne and their two boys. 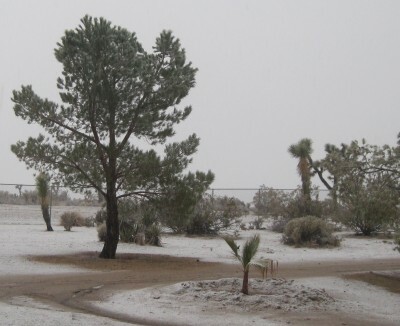 David and Leanne tell us to be very careful going down the hill from Morongo Valley into the Palm Springs area. The road is narrow, winding and steep without the comfort of a shoulder. We're taking it to heart and work our way to the other side of Morongo Valley where the descend begins. We needn't worry. We have guardian angels watching over us. This time in the form of David and Leanne. They have decided to be our follow car through the winding part. With their help we make it safely. Thanks once more! We can't go over it. We can't go under it. So we have to go around it. But where? Highway 62 takes us to the interstate. Without other alternative we're allowed to ride the shoulder to the next exit, two miles further. It's uphill, so it takes us quite some huffing and puffing, but we make it there. At the Whitewater exit awaits us a surprise. A couple of cars are parked there with a lot of boys waving and cheering. Are they waving and cheering for us? Yes they are! With the interstate behind us, it's a good time for a break and hear their story. They are a boyscout group from the Hemet area and have been out hiking on this beautiful day. When the patrol man has left, we talk some more with scout leaders Ed and Joe. We exchange phone numbers in case we need any help to get to Banning. It's good to have. We take the exit and curve to the east before the road ends in highway 111. From here we go west again. It's been an intense day. Lots of braking and climbing and now the changed interstate law. We see a housing development a couple of miles away and make that the destination for today. But it is not to be. Highway 111 pours into the interstate before exiting an eight of a mile further into Railroad Avenue. We're stuck on this side. Should we call 911 to find out if we can go? Should we just go and risk being 'escorted' off? Should we call Dennis for transportation? We decide to do neither. The sun is setting quickly behind the San Jacinto peak. We're not risking the crossing today. We turn the bicycle around to get off the on ramp. Time to find a place to pitch the tent. A couple of shallow sand dunes will be the place. a little out of sight of the road and plenty of space for the girls to play. Fun in the sun in the sand. Jasmine and Cheyenne are building castles. In the background on the mountain is a sampling of the many windmills in the area. Camp is set up. We have time to think about our next step. We call Joe and Ed and see it they can help. We're asking if they can take the girls and Amarins to Railroad Avenue tomorrow. Bill will ride the bicycle the part of the interstate. Joe and Ed immediately agree to help. Peace has returned to the camp now that we have found a solution. We never though this simple downhill day would have been so strenuous. We didn't stop at a store for fresh food, so we eat what we have with us. Weather: Uphill with a slight tail wind. A rough night with minds wandering. Let's hope that today is less adventuresome. It's a beautiful morning. Crisp and blue with the sun ready to warm us all. We're packing up so we'll be ready when Joe and Ed get here. The girls are back to building castles. Ed and Joe arrive with breakfast, hot chocolate, coffee, friendship and a smile. It's a good start of the day. 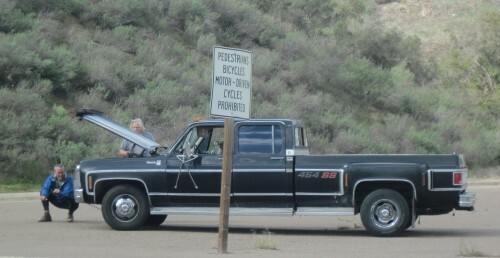 We load the trailer in the back of the pickup truck, as well as everything else that can be detached from the bike. The girls and Amarins hop in the truck and Bill takes the bicycle to the next exit. 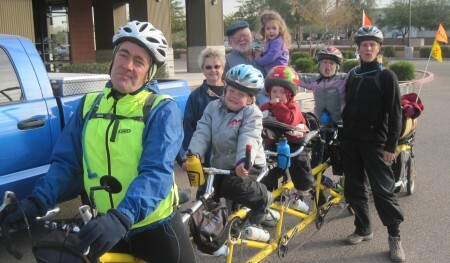 Bill has pedalled the eight of a mile interstate by himself. Barrier overcome, now we can hop on. 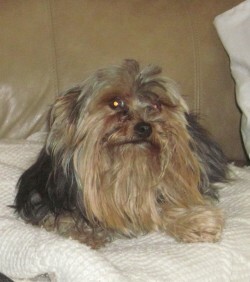 Tonight we are going to stay with Ed and his wife Chris near Hemet. We decide to leave the trailer in the truck and only take food and tools. And we're off again. 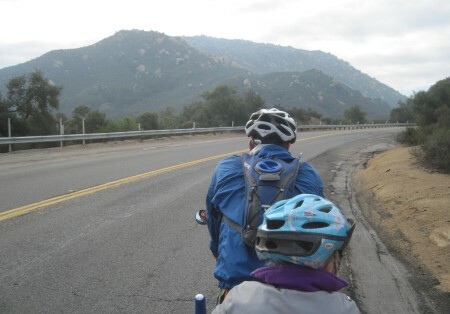 We ride at the foot of San Jacinto. An impressive mountain. On the other side of the interstate we can see San Gorgonio, even taller then San Jacinto. The snow makes them even more distinct. It's a steady climb up to Banning pass. 18.9 miles uphill to Beaumont, according to Joe. That's going to take us a while. We can see the tall Indian Casino in Cabazon. Little by little it's getting closer. We're thankful we don't have the trailer with us today. We're in our lower gear and are pushing hard. Then out of the blue we're stuck. The drive chain has wrapped around the rear hub once more. Everybody off! Total lock up. Chain wrapped around hub again. By releasing the chain, the cassette came detached. Something that has never happened before. Very strange, but Bill can put it all back together again. What are we to do. Well, we take this shorter road. Shorter perhaps, but full of obstacles. Pictures tell more than words. This road is not so bad. We're on gravel, with a swimming pool ahead of us. We hug the train tracks to get around the water: deep gravel. It's a total wash now. We made it! Never thought we'd be mountain biking with our quint. The roughest miles of our journey for sure. We are so glad we don't have the trailer with us. We wouldv'e been stuck in the wash. It's already in the early afternoon. Beaumont is still seven miles uphill. We keep on pedalling. Up and up, mile after mile. 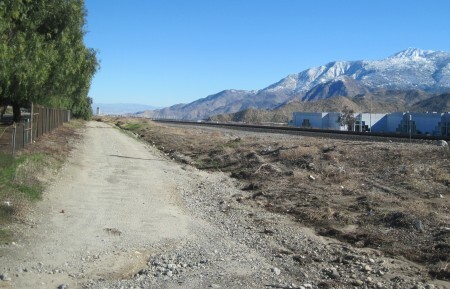 Finally, we make it to Beaumont Avenue, which will take us south off the mountain to Hemet. But before we go, we need to eat. We find a fast food mexican place. Some burritos will be just fine. One more hill and then we zoom down the mountain. Down down we go. A beautiful ride. Curving and swerving, down to the valley floor. Literally breathtaking. What took us all day to climb, takes us less then an hour to descend. By four we arrive in San Jacinto. We leave the bicycle in town. Joe takes us up to Valle Vista where we'll stay at Eds house. The view from Valle Vista is incredible. To the west we look over the citrus groves to the mountains after which the Pacific Ocean lies. To the northwest we see the Baldy (now San Antonio peak) standing tall, over 80 miles in the distance. To the north is San Gorgonio, the highest mountain in southern California. To the north east is San Jacinto. Here we are on the southside of this mountain, where we were still on the northside of it this morning. A lot can happen in a day. 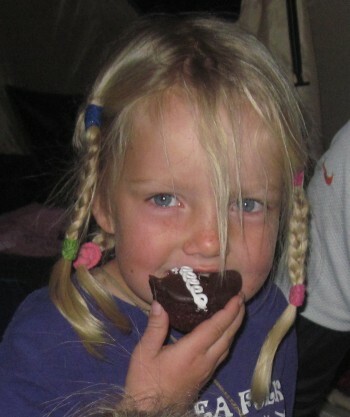 There is a party tonight, because it is Cheyenne's birthday tomorrow! Thanks for putting it together Ed and Chris and everyone else involved too! The smell of pancakes takes us all to the kitchen. Chris is up and is cooking away. 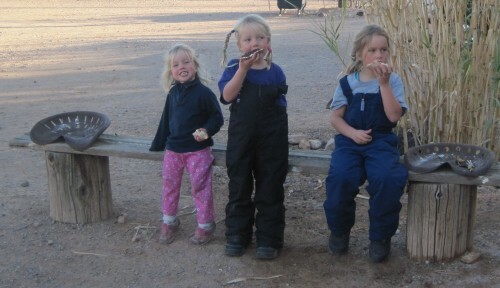 With four children of their own and our three, not forgetting the grown ups, you need to be able to cook up a storm. Delicious. By detaching the wheels on the trailer, we can load it in the back of the van easily. 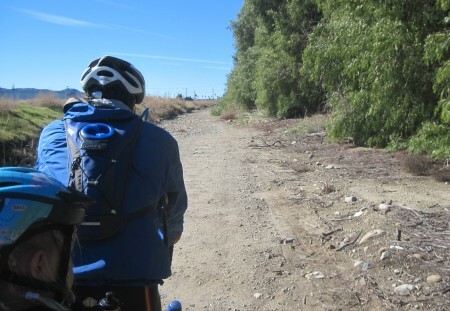 Chris is bringing us back to San Jacinto where we will pick up our trail again. Thanks for letting us store our bicycle in your garage Rex family! We're riding and riding and are still in the Hemet area. This is a big town. We stop at the Donut Hut for a celebratory donut. Yumyum. At a mercado we buy some fresh groceries. Then we ride again. We ride as if we have all the time in the world. We look back often. Just to look at San Jacinto. We made it around it. Incredible. On the west side of town, already on the Domenigoni parkway we meet Joe. He's arranged for a reporter to meet us here. Cheyenne is sharing the lego's with Jasmine. It was a gift from McKay. With yet another break it is time to put the spin to it. We're going to stay in Temecula tonight. It's almost noon and we're not yet halfway there. The road is very nice to ride on. It has a broad shoulder and is rolling hilly. Just before we reach interstate 215, in Menifee, we turn left on Antelope Road. This road parallels the interstate for the next miles. When we get to Murrieta we manouver ourselves across town to the west side of interstate 5. We're thankful for the directions Joe and Ed have given us. We can find our way easily. Riding in a city is not a fast way to get around. Finding the way, stop signs and red lights. But we're getting there. 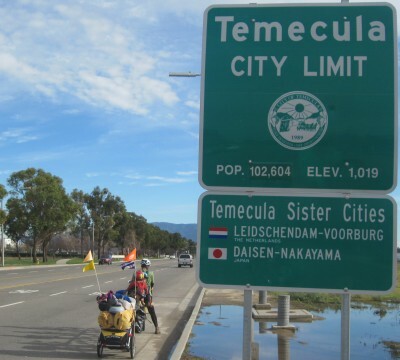 Temecula is a sister city to a town in the Netherlands. 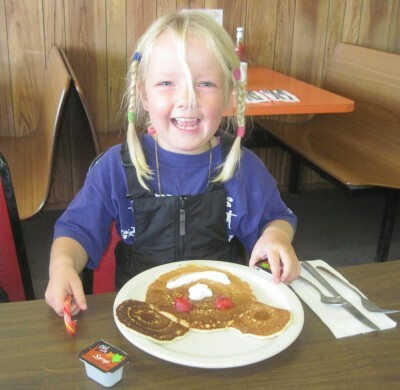 We stop at Big Boy's for a snack. It's a good place to find out where we need to go next. It also turns out to be a good place to meet people. We're offered a place to stay on the south side of town with David and Cathie. We have a place to stay tonight, but with rain rolling in tomorrow, we gladly take them up on their offer to stay tomorrow. Hot fudge brownie with icecream. Yummy! 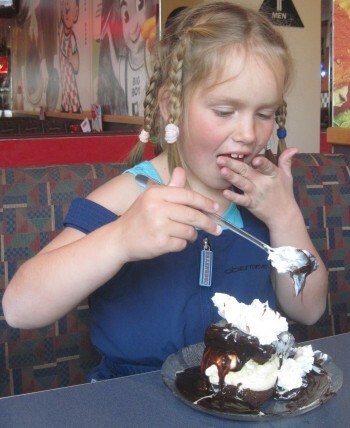 From the Big Boy ladies to the birthday girl (with extra spoons for us all). We ride to the GRN building; Global Recordings Network. John works here. This is where they have recordings of over 5,800 languages and dialects. An amazing operation. We get the grand tour and see the old recording devices in the museum of the building. Very intriguing. Before we know it the evening comes. 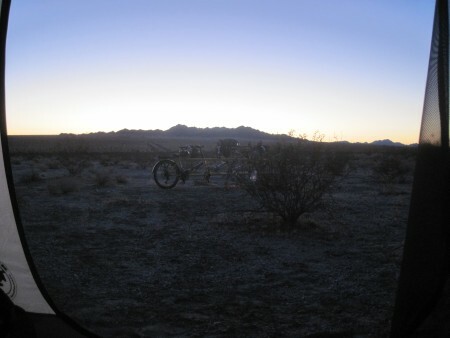 Still enough daylight left to ride to John and Rosa's home. We arrive with the sweat dripping off our backs. The girls? They have enough energy to jump around on the trampoline with their new friend Anna. And that's how it should be. 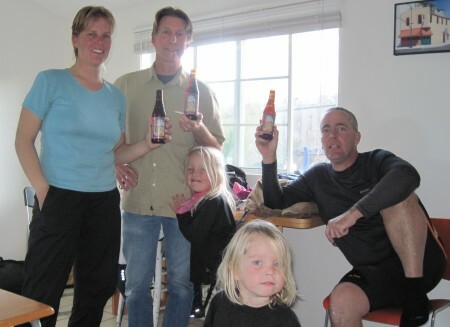 We enjoy the evening in the company of John and Rosa and their children. A loving home. Thanks for having us over. Weather: Rain? Not till in the late afternoon. With the rain coming, we're going to stay in Temecula. 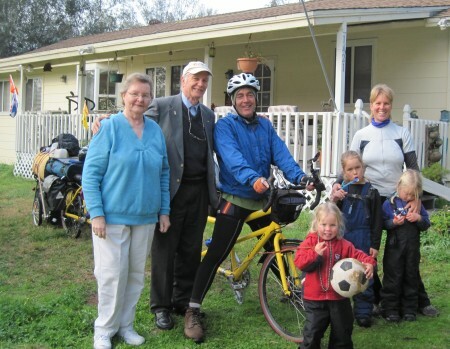 Bill will ride the bicycle to the home of David and Cathie. 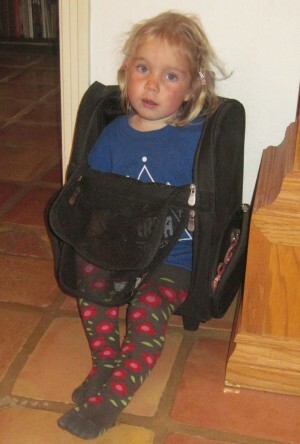 Amarins and the girls, and most of the luggage, will ride with David. All in anticipation of the coming rain. So far, the morning starts bright and sunny. Bill is working his way up and down the hills, while the girls are settling in with an abundance of building toys. 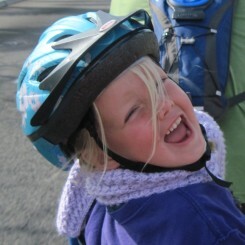 When Bill arrives with the bicycle, we take a moment to celebrate Cheyenne's birthday once more. Today we have the time for her birthday gift. Time for the birthday present! It's still not raining. We are taking our chances and head for the playground. Swings and sand, a lot of joy. 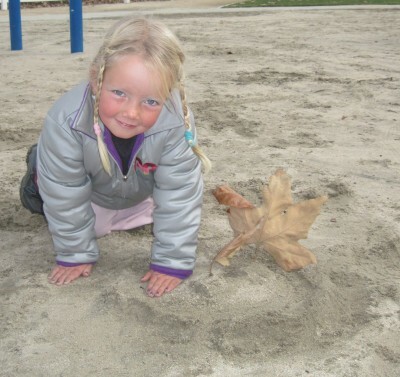 Jasmine build a sand castle, with the leaf as flag. Cheyenne is trying to break the jumping record. We get to meet more of the family at supper. Out for supper with David and Cathie and family. Weather: Cloudy morning, sunny eve. 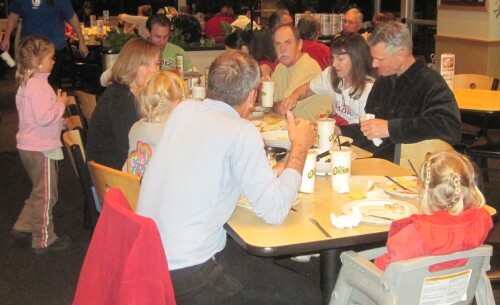 We have breakfast with David and Cathie, then get ready to go. The rain has gone elsewhere. Still a little cloudy but dry. With bicycle friendly directions we head out the door at roughly 9am. We've got some climbing ahead of us. Up up and around. A beautiful winding road. It's quite a climb but beautiful. The road twists and turns. Trees are hanging over the road. Boulders are all around. Then we get to the crest and find palmtrees on the left and living oaks on the right. A pretty lane like road. The interstate is on our side, a little down below. 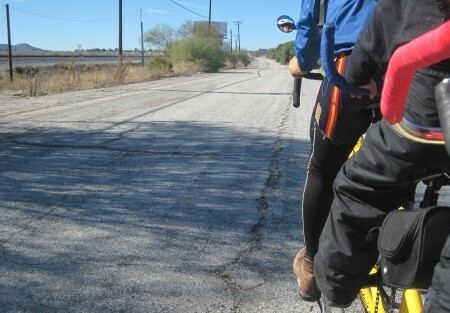 We ride through the outskirts of the Rainbow community before descending towards the highway 76 intersection. We find a nice little mexican restaurant. We decide to have lunch before taking on the steep mountain ahead of us. A quesadilla is our choice meal. A quesadilla lunch at highway 76 in Fallbrook. Talk about a climb. From the terrace we could see the interstate winding its way up the mountain. We are on the old highway 395, which goes even steeper. We go up and up some more. Rest and up again. On the way up a fellow biker comes along side, curious about our bicycle. He talks us all the way to the top. Perhaps we can see the Pacific Ocean from here. We look as far as the eyes can see, but see no water. As the crow flies we're probably less then 15 miles from the water. We have to wait till another day before we'll lay eyes on her. There is a down side to this mountain, which suits us just fine. As soon as we are over the crest we start rolling already. We get up to a nice speed when we see a driver having trouble with his car. We decide to stop and see if Bill can help. It turns out he can. Giving back. A stranded driver needs help changing his tire. We are truly amazed with the mountainous terrain. It is magnificent. Every valley seems to have a new view to it. One is filled with boulders, another with citrus groves, yet another has lots of houses and fields of grass. We still have a couple of ups and downs to go before we arrive in Escondido. But we make it eventually. We will stay with Ray and Rosemary till Monday. Monday will be the day we aim for the Pacific Ocean. 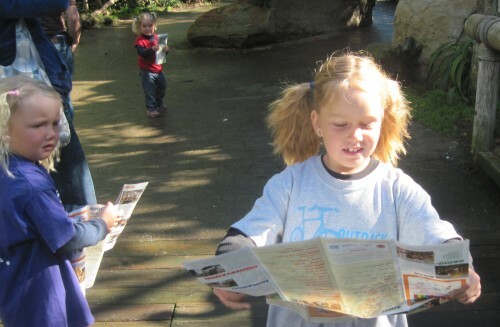 Where to go in the Wild Animal Park. 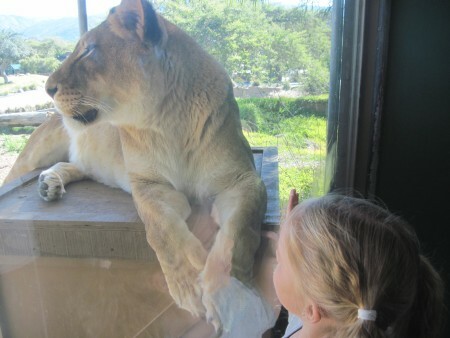 Jasmine is up close with a lioness. 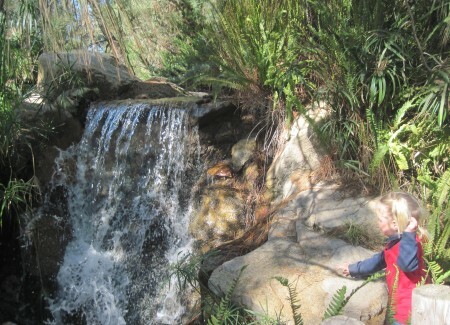 The road leads us to a series of water falls. The girls get to pet deer in the petting zoo. Thank you Bob for providing us with the tickets to this beautiful wild life park. 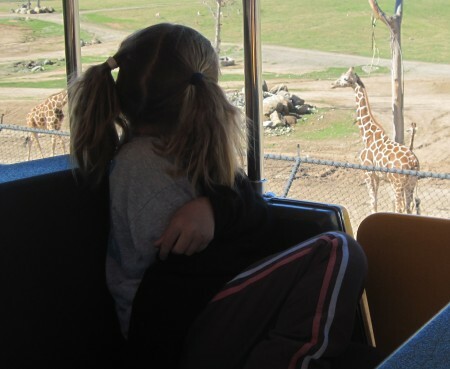 A busride that takes us all over the zoo. This way we get a good isea about the distances. 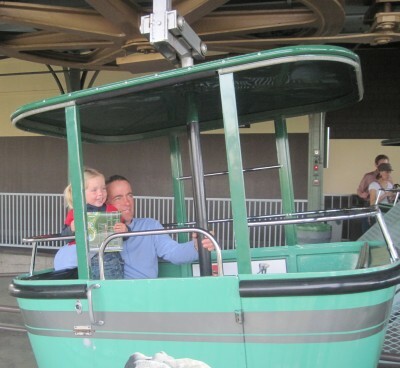 We take the gondola to the top of the zoo. From here we take the several pathways and escalators to see as much as we can. 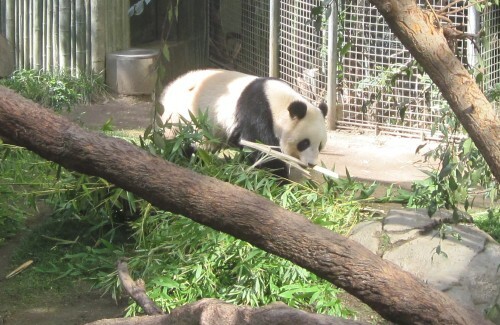 The panda is definitely the animal of the day. The easy way to get up the mountain. 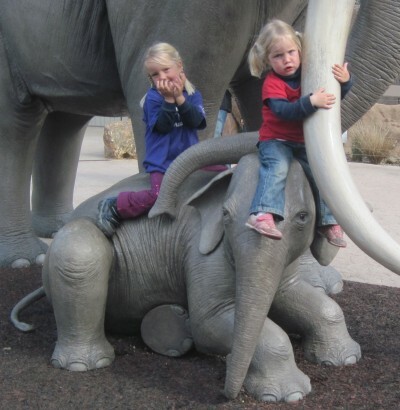 Going back in time with the mammoth. 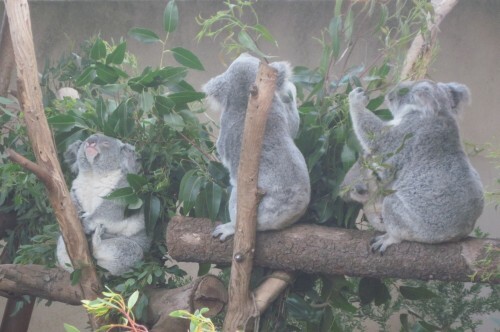 The koala family with joey. 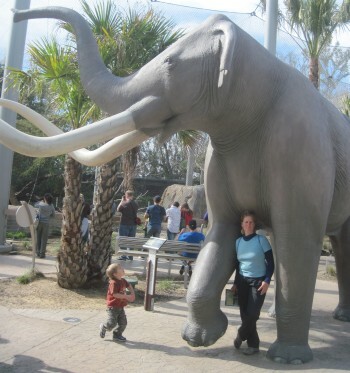 We were able to visit the zoo thanks to James. 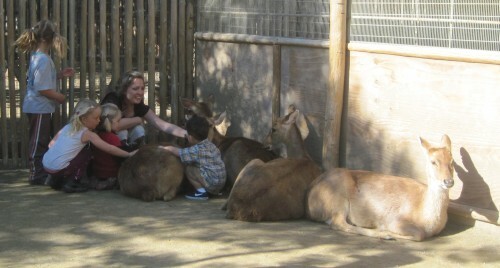 Thank you Ray for taking us first to the Wild Animal Park and today to the San Diego Zoo. Days to help Ray in and around the house. The girls are taking it easy. Amarins works on the web. Thanks for letting us stay in the 'coyote din'! We've enjoyed our time here in Escondido. 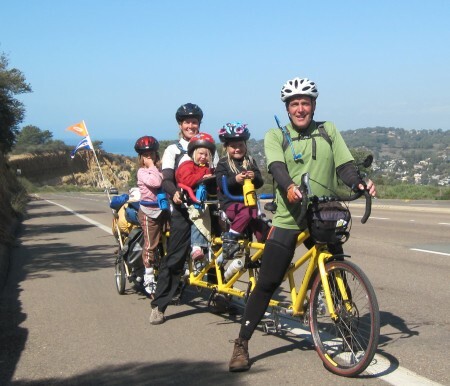 Tomorrow, February 1, we are riding to Encinitas to put our feet in the Pacific Ocean! 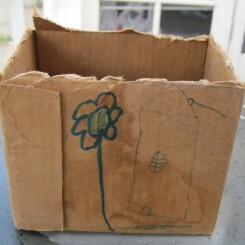 Cheyenne and Jasmine have been working hard yesterday on making a flower box for Rosemary. They have left it with Rosemary with the instructions to wait for the flowers to grow and not to cut them. It'd be nice to see the result of all this hard work. 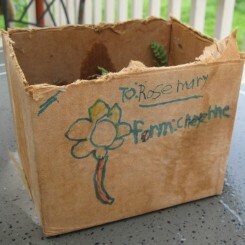 Cheyenne and Jasmine have made a flower box for Rosemary as a thank you. Ray is leading the way, from Country Club drive to Harmony Grove into Elfin Forest road. It is a beautiful route. With ups and downs, though mostly downs so far, with hills all around us, covered with boulders and trees. It's like a fairy tale land. Thus the name of the road we assume: Elfin Forest Road. 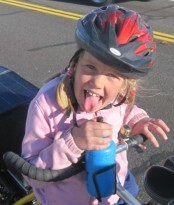 We pedal and pedal and let out several cheers for the ocean. But not on the uphill slope; that's when we huff and puff. 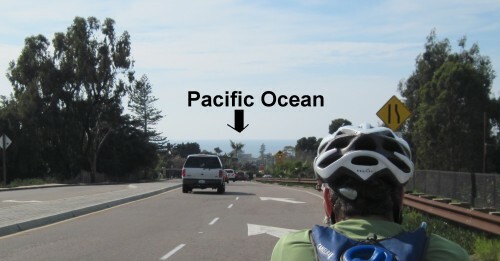 Javier is riding with us on this momentous Pacific Ocean day! 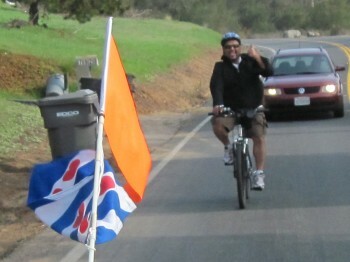 We take a break several miles before San Elijo. 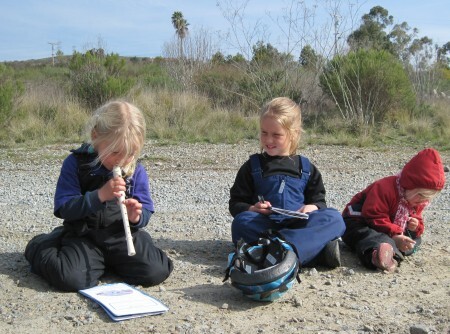 The girls pull out their flute and harmonica. It's time for their first roadside performance. This first one is especially for Javier. A good way to gain some confidence. We continue the road. It keeps going up and down. Each time we crest, we crane our necks to see if we can see the ocean yet. Nope, not yet. Nope, not yet. Maybe after the next hill. But nope, not yet. 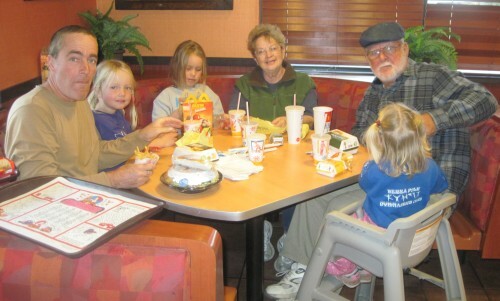 We have our lunch at the McDonalds with playground in Encinitas. This is where we meet Kevin and his wife Melissa. Kevin is going to ride with us the last miles to the ocean. We should be able to see the water at the top of the next hill. Then it's a downhill stretch. First the girls get to play for quite a while at thee playground. The last hill is here to see if we're really ready to arrive at the ocean. It proves to be quite a hefty one. We have to stop and rest several times. Javier and Kevin are riding circles around us, yet stay by our side. They can feel the elation. Words cannot express how we feel inside when we finally see the ocean. Lack of comprehension on our side results in lack of expression. We ride the final yards full of high spirits and pride. The final yards to the ocean. Our arrival at the Pacific Ocean. Today we soak up the feeling of having made it to the Pacific Ocean. 3,800 miles. Six months. Two oceans. Thirteen states. Nineteen flat tires. Five falls. An abundance of broken spokes. Six new rims. Countless innertubes and outer tires. Two new chain sets (5 chains each). An extra drive chain. Handle bar wraps, nuts, bolts, bells. A new Burley trailer. We're going to Mexico today! What an exciting anticipation. We're not goiing by bicycle. The weather looks iffy with chances of rain. Plus we're not quite certain if the roads will be safe for us to travel on after the rain they've had in the past weeks. 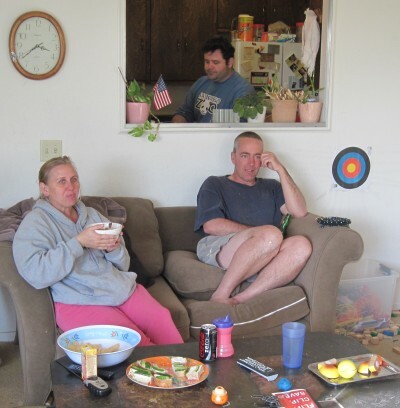 We're not quite sure what time we're leaving, but we're welcome to stay at Kevin and Melissa's during the day. This morning they're taking Mae to the doctor. We will bring Kai to school down the road. We get there a little early so he can run circles to gain tickets. 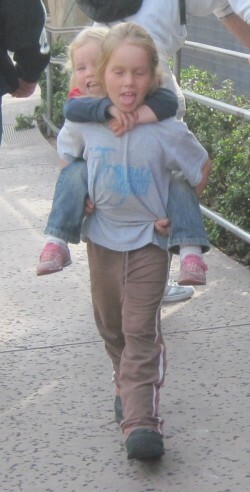 Cheyenne and Jasmine run with him to help him gather some extra tickets. It's an all school experience. 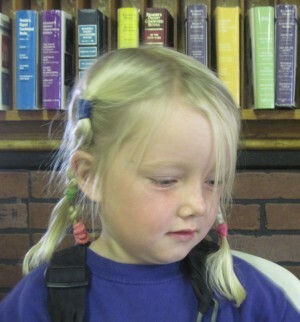 From grown ups to the kindergarden class, there are runners from every group. With Kai in school it is time to start packing. What are we going to bring, what can stay here. 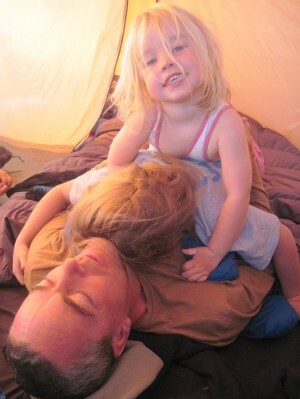 We're staying in a casita, so we don't need our tent, sleeping bags and mats. That'll safe a lot of space in the car. 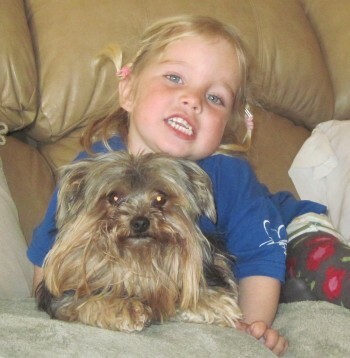 We're still there when Kevin and Melissa come home with Mae. All went well. robin and Mae head straight to the sand box. 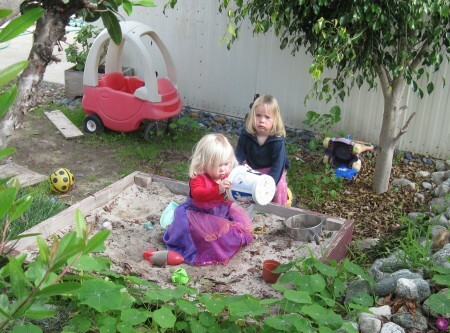 Robin and Mae are playing in the sandbox. The day is filled with playing and waiting. Bill and Kevin work on the facebook page to add videos and pictures. If you're not yet Bill's friend on facebook, go to our homepage and click on the facebook link provided. The videos are really good. As the sun gets closer to the horizon, our ride arrives. 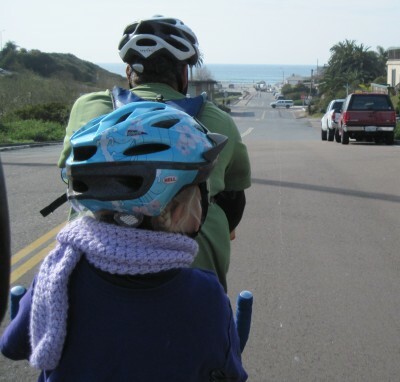 We ride with Annie and her daughter Caitlyn. It is dark as we arrive at the border crossing. Always a tense moment, but all goes well and before we know it we're in Mexico! 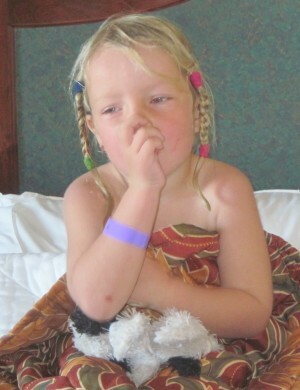 Read about our wonderful experience in Mexico! We're up early. Getting ready to beat the crowds to the border crossing. It is a beautiful morning. The islands are visible in the distance. We're looking at the 'Mexican Pacific' once more before we jet off. We arrive at the border around 10am. There is a lot of traffic already. The lines keep moving up slowly but steadily. It takes maybe forty minutes and we're through. Back in the US of A. This went very 'painless'. We arrive in Encinitas before lunch. It took us less then two hours to travel the distance from Rosarito, Mexico to Encinitas, California. 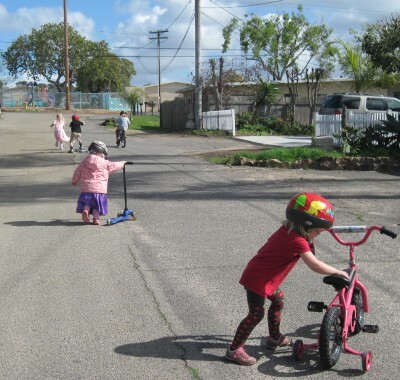 The kids are immediately all over the bikes, skateboard and scooters. We're going to take them to the playground so they can run off some steam. Time to head for the playground. 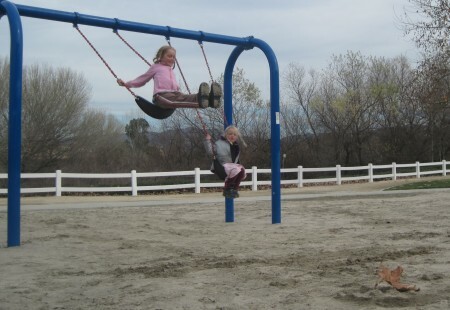 The kids enjoy the exercise playground. It's a beautiful day to be out playing. It also makes for a nice walk. When we get back there still is some time to prepare for the Superbowl. Melissa's team wins! What a way to close the day. 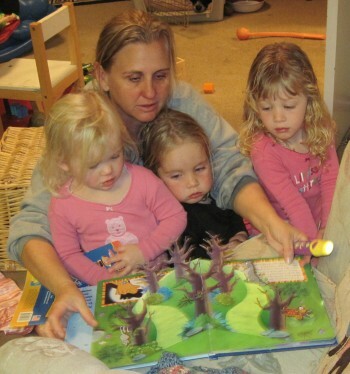 Mae, Robin and Lauren are having storytime with Melissa. Weather: Nice. Very nice. Even a little tailwind. Although we made it to the Pacific Ocean already, this leg of the journey is not finished until we make it to San Diego. Today is the day to do just that. We're saying goodbye to Melissa and Kevin once more, only to tell them we'll be back on Thursday, on our journey north. 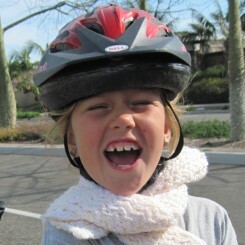 Jasmine is all ready with fresh flowers from Kevin and Melissa's garden weaved into her helmet. We roll ourselves slowly down the hill towards the coast. The sight of the water with its majestic waves is gorgeous. The name of the road changes every couple of miles. In short it's old highway 101. It takes us up and down the cliffs. Sometimes closer to then again further away from the ocean. It is the season the grey whales are migrating down the coast. We keep looking in the hopes of seeing one spout. The road takes us up the Torrey Pine cliffs. It is quite a climb to get up Torrey Pines. We stop on regular intervals to catch our breath. We're about halfway up the hill when Jasmine informs us she doesn't like this hill. "I like REAL hills better." This makes all of us laugh. Apparently this hill is just not hill enough for her! Picture taken with a lightweight tripod and timer. We'll finally have the chance to make family pictures! We're still climbing up Torrey Pines. We're at the top of the cliff for a little while. 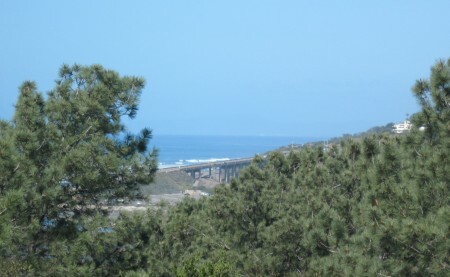 We enter the La Jolla area via La Jolla Shore boulevard, a steep downhill road. Whereas usually we don't look back a lot, here we do. We know we'll be climbing this road all the way when we start on our northbound leg on Thursday. What goes down must come up in this situation. We pass the Ferrari, Masserati, Rolce Royce and Lamborghini dealers. At the latter we ask if we can trade the bicycle in. But no, they can't do that. Cheyenne asks Amarins in a worried voice if we'd really do that. It doesn't look like a good trade to her at all! 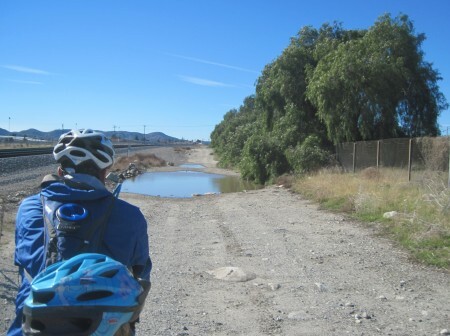 We find the route to Ocean Beach with little problems. We cross the 'tiny little baby bridge' (according to Robin) over the San Diego river. A couple more turns and we have arrived at our destination. We have concluded the fifth leg of our journey after 942 miles, for a grand total of 3,827 miles. Cheers to finishing the fifth leg of our journey! We're celebrating it with Todd in San Diego. Weather: Brisk and cloudy with evening rains. 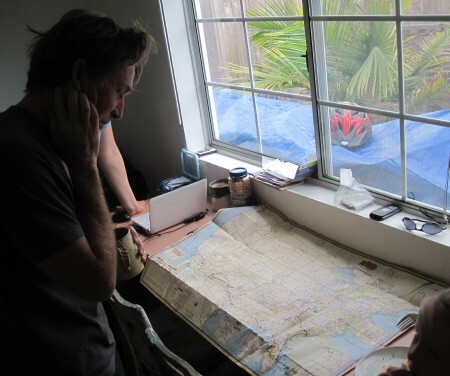 Amarins is showing Todd the 'master map'. We have our route and every place we stayed marked on it. As well as other momentous moments. We're staying in San Diego these days. This morning we have breakfast with Todd's friends Pat and George. After breakfast they take us to the Cabrillo National Monument. Downtown San Diego from Point Louma. 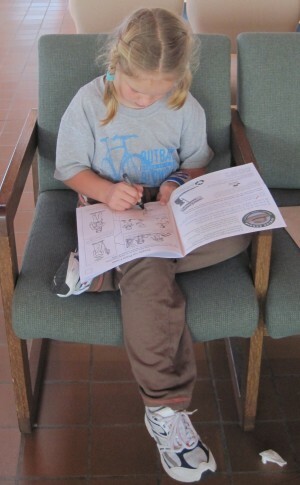 Cheyenne is working on her ranger badge at Cabrillo National Monument. 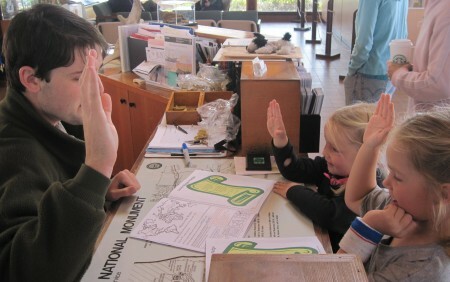 Jasmine and Cheyenne are taking the junior ranger pledge. Todd is off to work during the day. The girls swarm right over him as soon as he comes home. As soon as Todd comes home from work he's under attack from the girls.